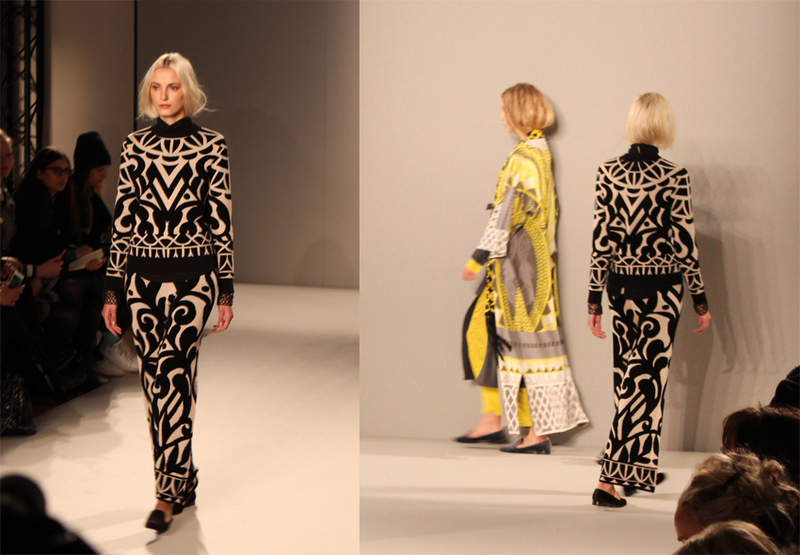 Here is another snapshot of what I saw at LFW15. 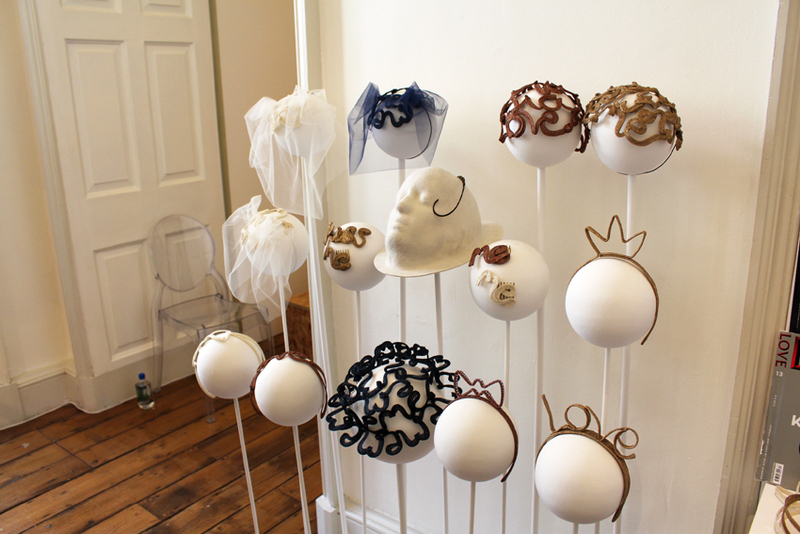 I can’t forget about the gorgeous hats, fascinators and headpieces! 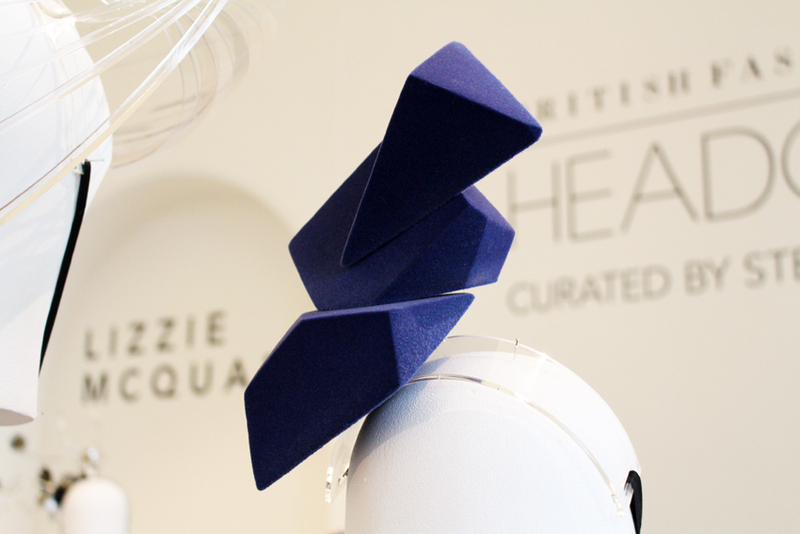 Keely Hunter Millinery showcased her AW/15 Fourth World collection which explores the futurist designs of science-fiction created through a mix of textures and concave shapes aimed to conjure up a sense of portals and unimagined worlds. 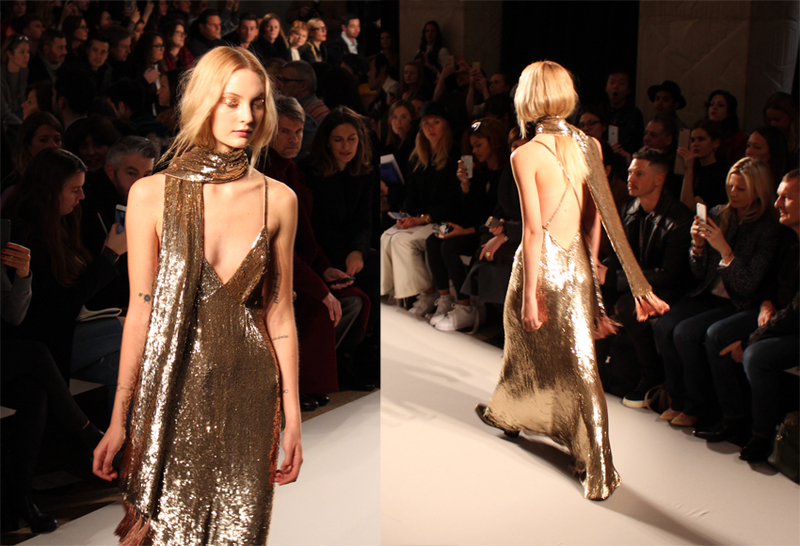 Keely was trained in London and worked under various couture designers before establishing her own label. 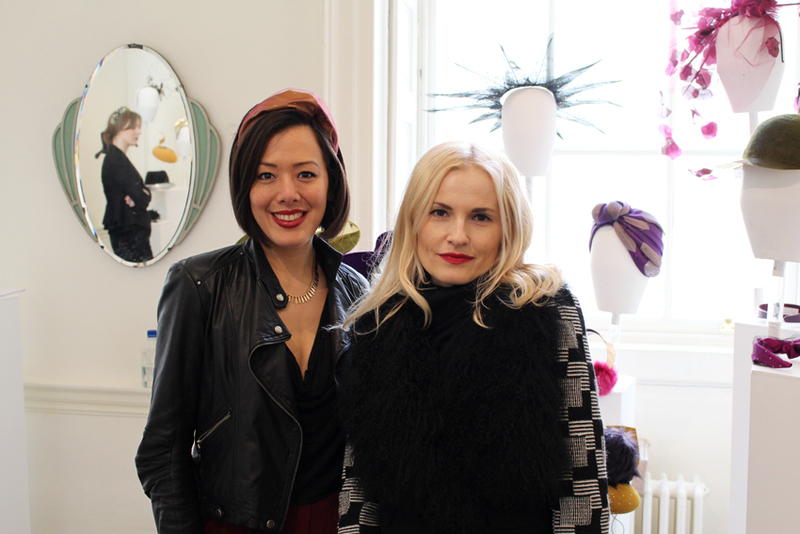 She appeared in numerous fashion publications – including Vogue Germany, Vogue UK, Vogue Italia, Grazia and Wallpaper and was named by Selfridges to be a Bright Young Thing – the first milliner ever chosen for the store’s ‘next big thing’ designer showcase. Here are some of my favourite designs. 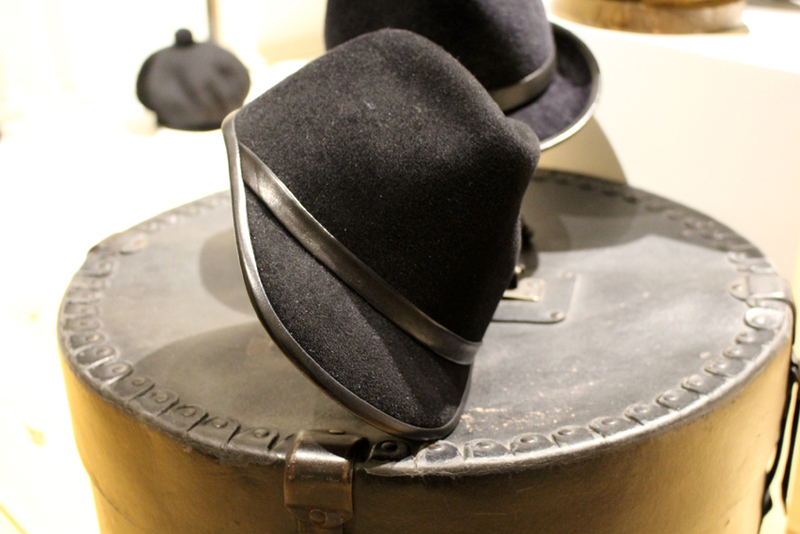 For everyday use, I loved the Perspex Peak Hat and Charcoal Mohair Tall Crown. 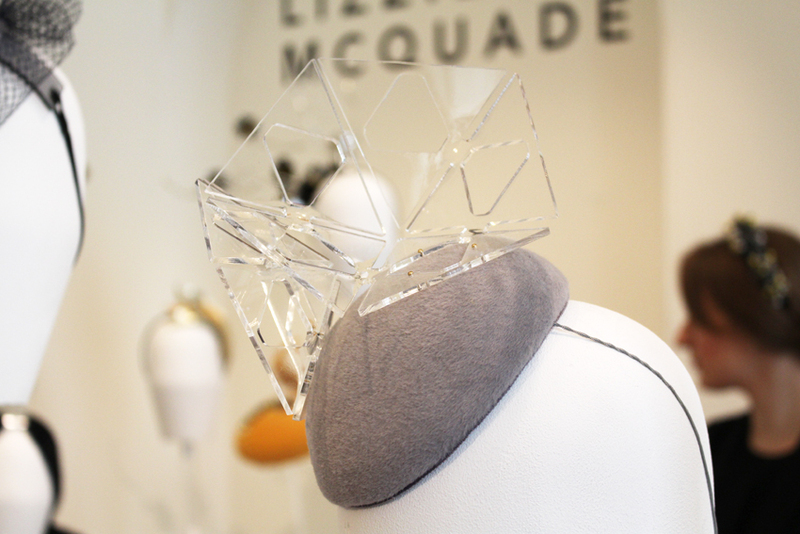 For a more avant-garde look, the Block Headpiece, Mirror Saucer and Hexagon Percher definitely stood out! 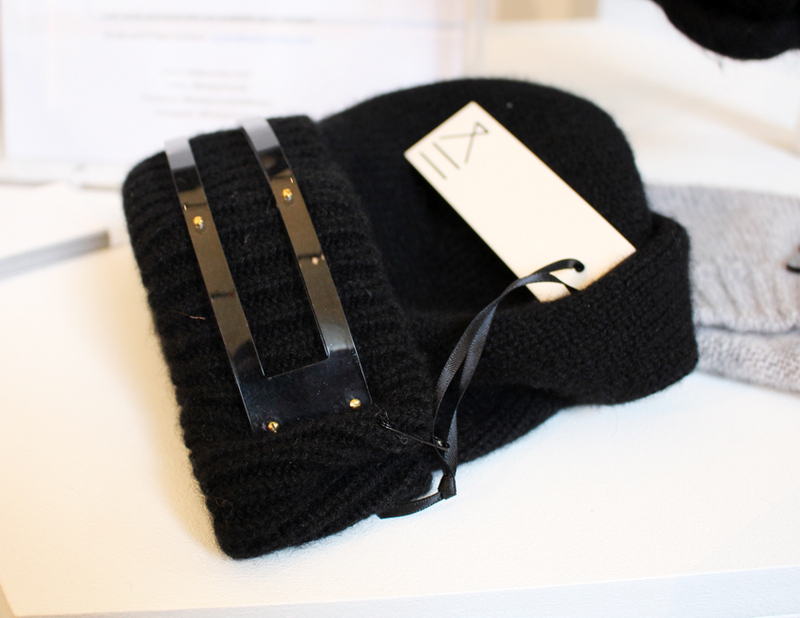 I am a huge fan of winter warm woolie hats so I fell in love with these Un-spun snood and Casmere Perspex Beanie! 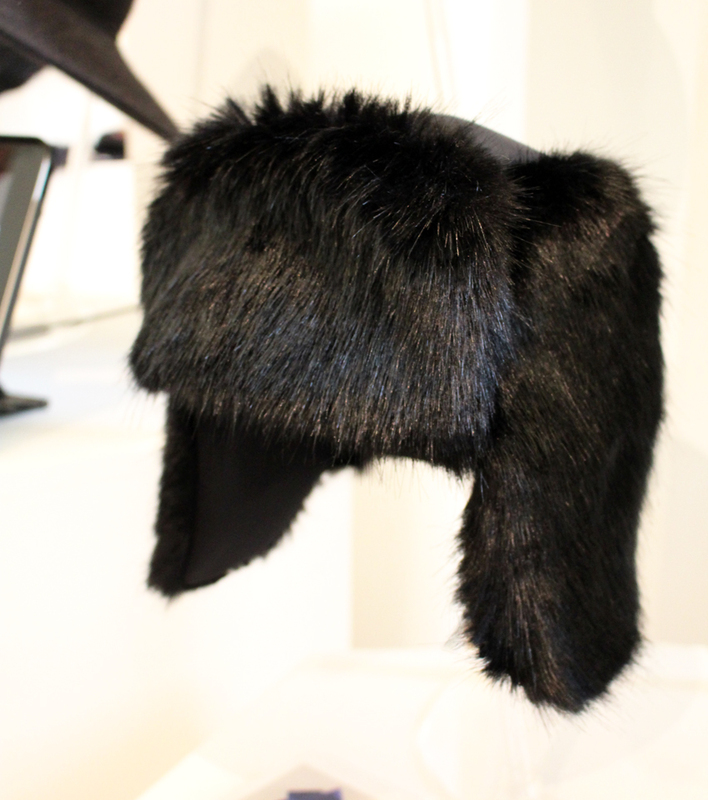 The black faux fur neoprene trapper was so cool too! 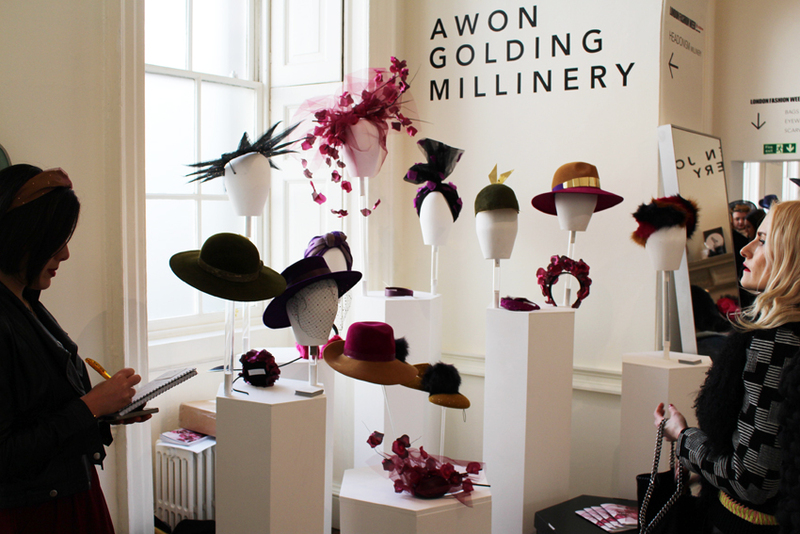 AWON GOLDING MILLINERY was another brand that caught my eye! 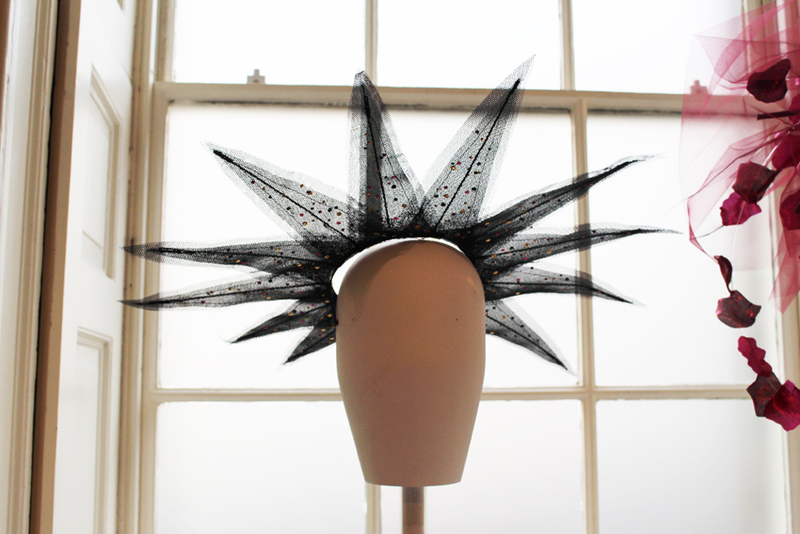 Awon Golding is a London based milliner drawing on her multicultural heritage (she spent a lot of time in India. 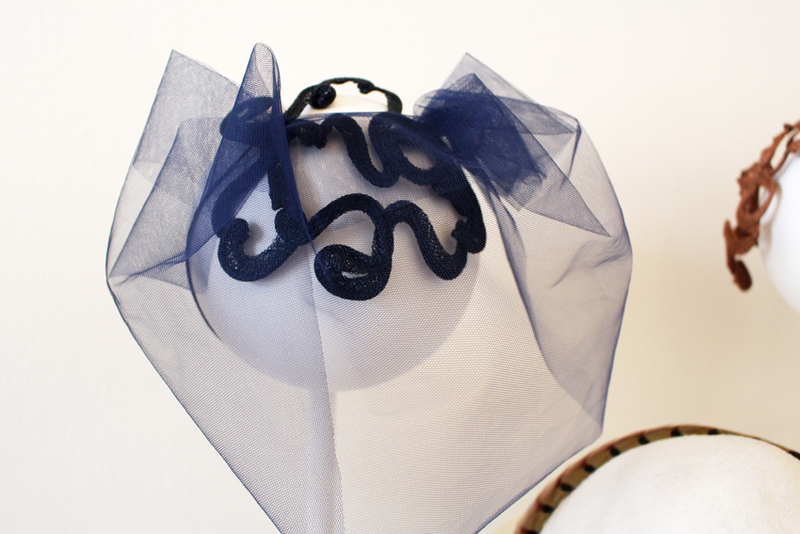 Hong Kong and England) to inspire dynamic headpieces. 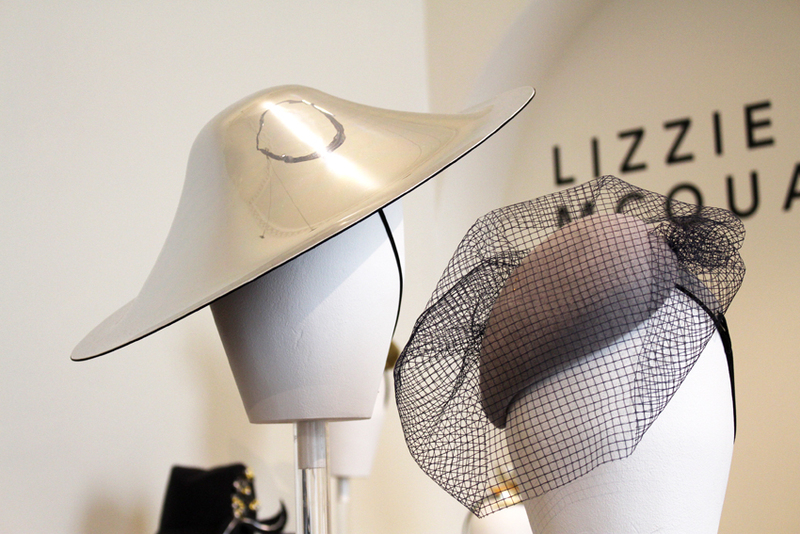 Creating dramatic silhouettes, with each piece handcrafted in her London studio, her creative talent was recognised by The Honourable Feltmaker’s Guild, when Awon was awarded first prize in its annual millinery competition in 2010. 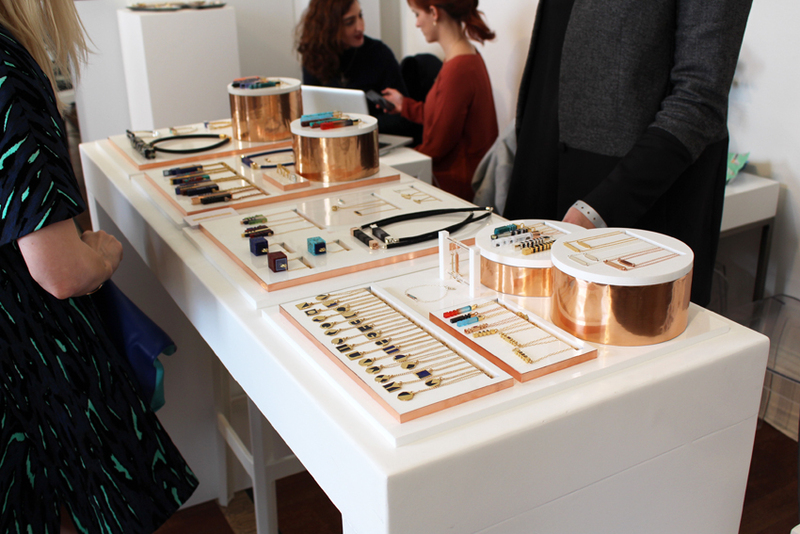 Currently her pieces are being sold in London’s Liberty! 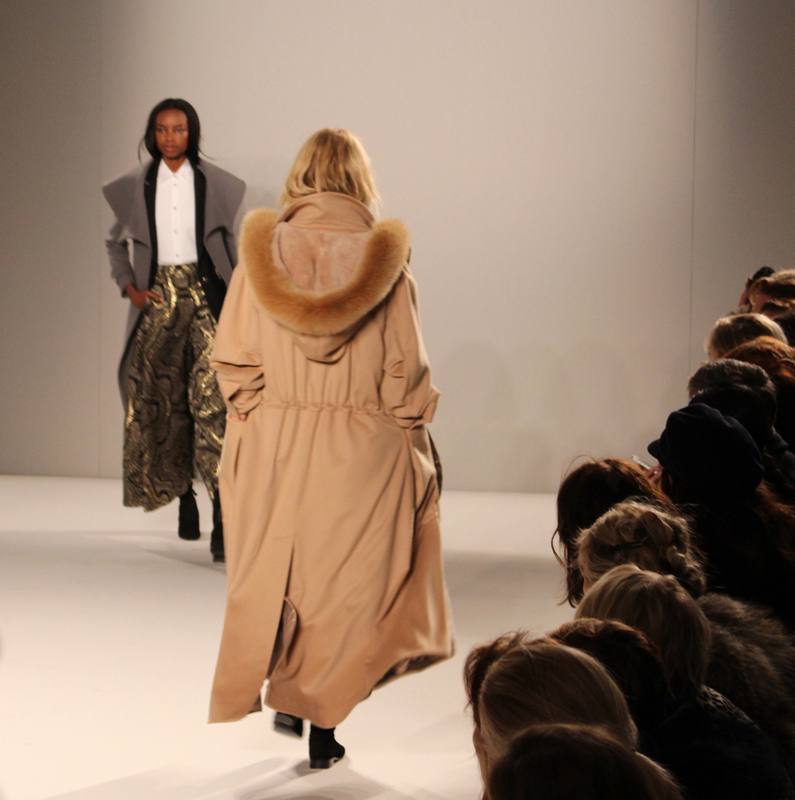 At London Fashion Week, Awon Golding showcased her AW/15 Floral Decay collection full of crispy autumn hues, from rich pinks and purples to the earthy tones of warm mustard, moss and gold. 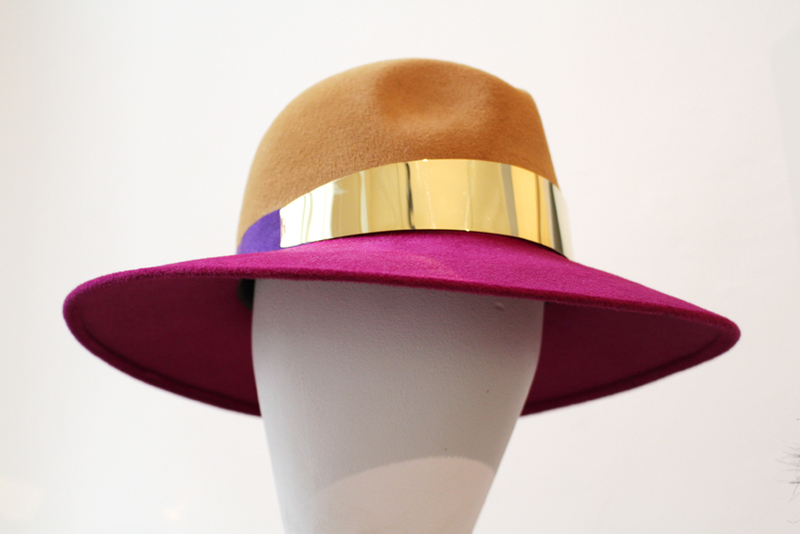 My absolute favourites are felt hats so I immediately fell in love with this Calyx soft two-tone mustard and magenda fedora velour felt hat set off by a mirror-polished trim band. How stylish is this eye catching diagonal Heath multi-fur cossack headband made from hot pink, natural fox and purple faux fur! 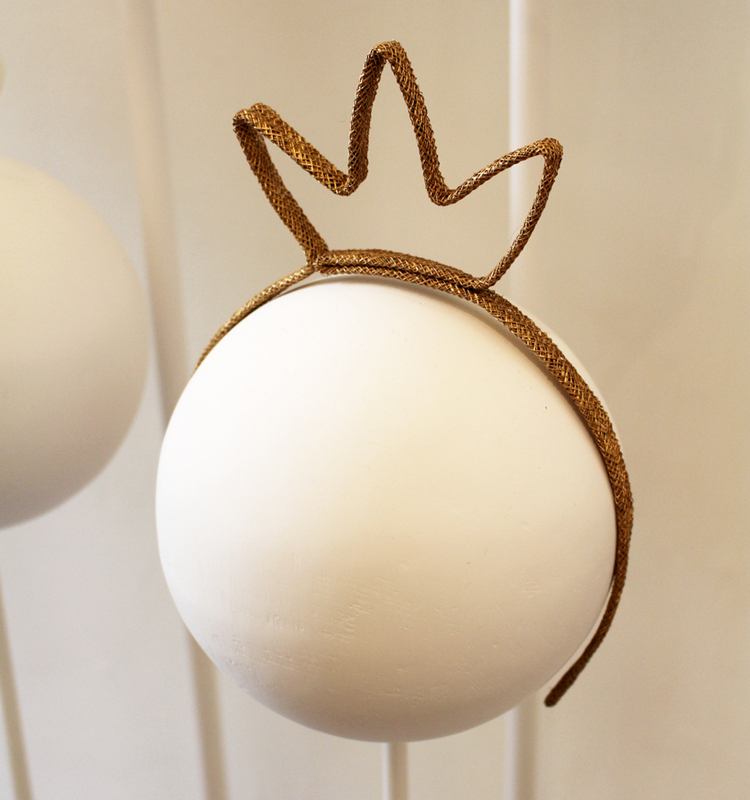 I really liked this Polen statement beret disc that adds glamour to any outfit. 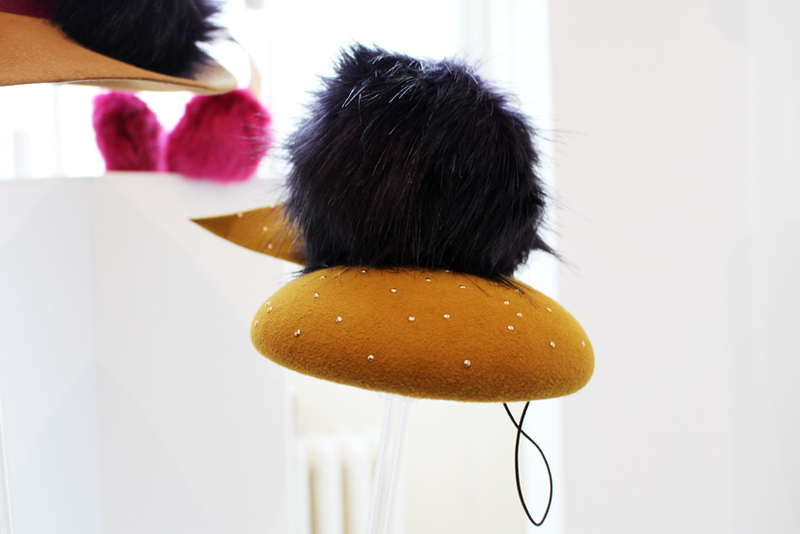 Mustard velour felt base and bow with purple faux fur pom pom and gold crystal accents will make you stand out from the crowd! Finally, Zoe Sherwood! 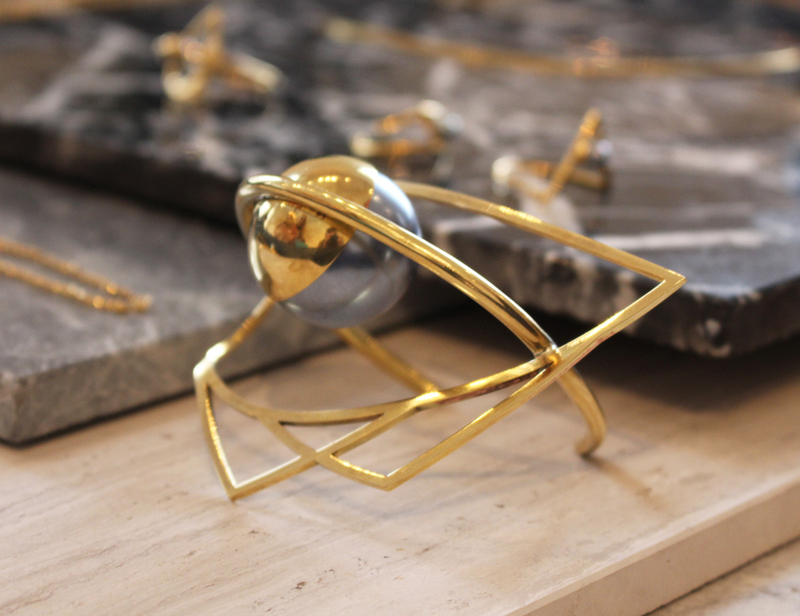 I loved her signature sculptural pieces inspired by nature. 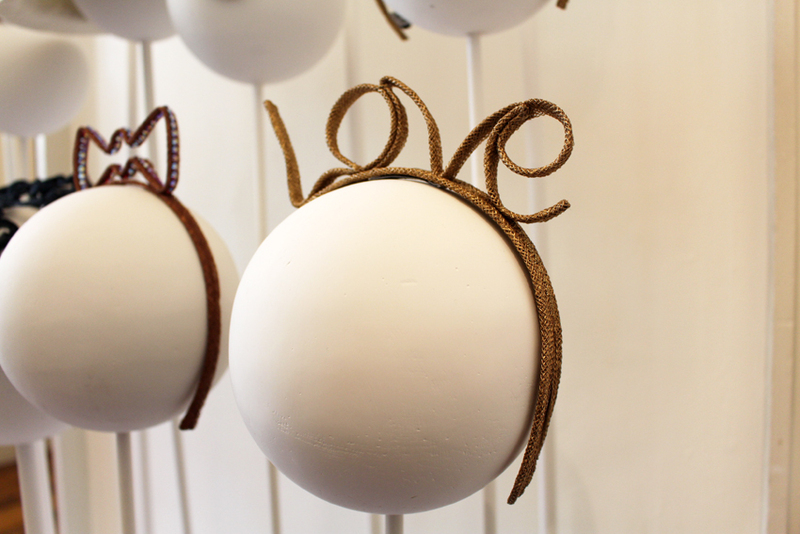 Central St Martin’s offsping – Zoe is a London based head piece and ornament designer who, before graduating worked with the likes of Diane von Funstenberg and her hair ornaments are currently selling at Liberty’s under their “Best of British Talent”. 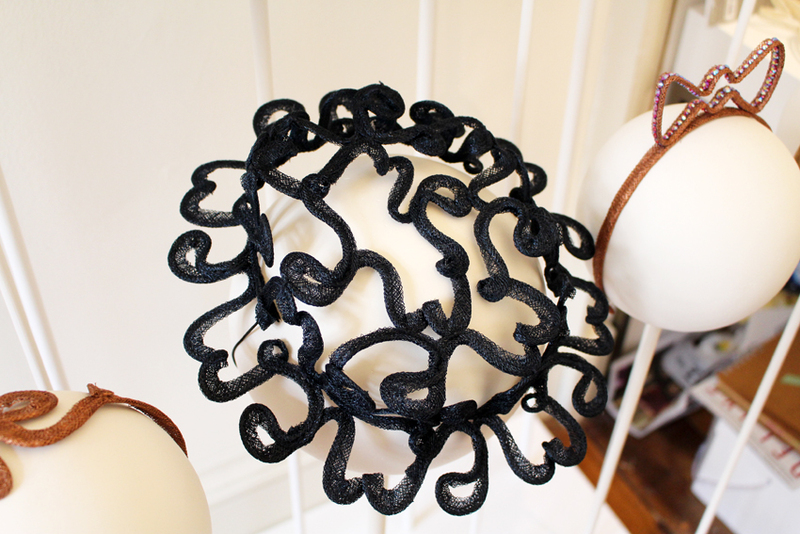 How funky is this High Crown Band made of sinamay and millinery wire, hand sculpted into the shape to comfortably fit on the head! 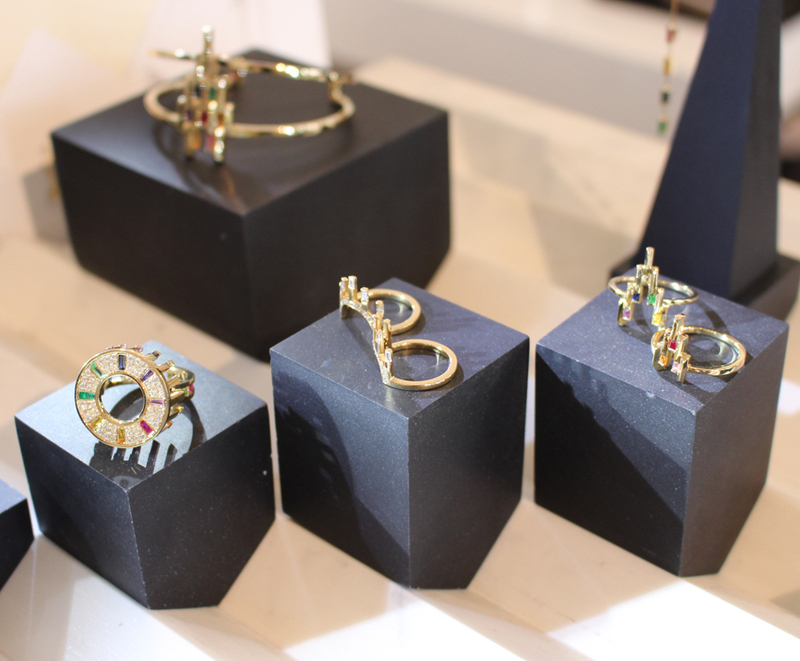 Which one is your favourite piece? 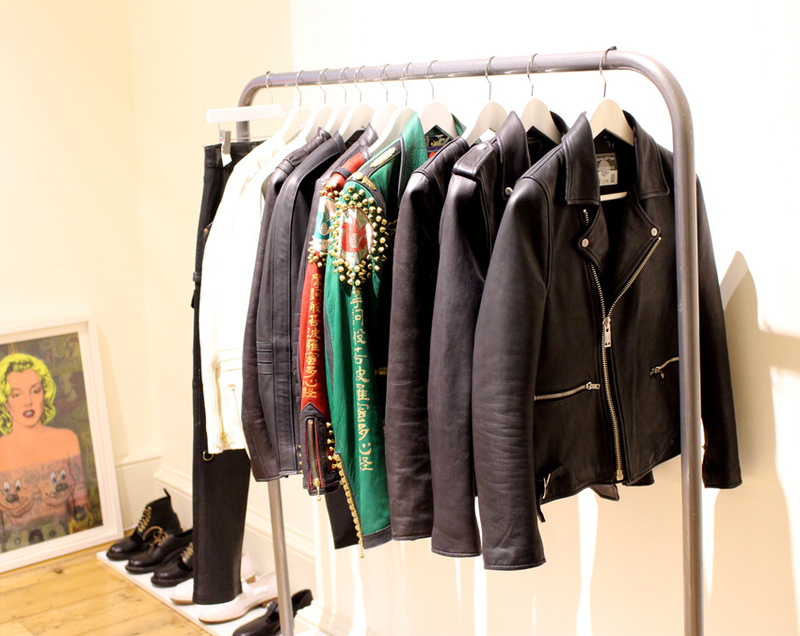 If you like what I have chosen, why not sign up for my weekly style updates! As the weather warms up lifting our spirits and shaking off winter blues, this is probably my last wintery outfit this season. As much as I love shearling, I can’t wait to busk in the summer rays! 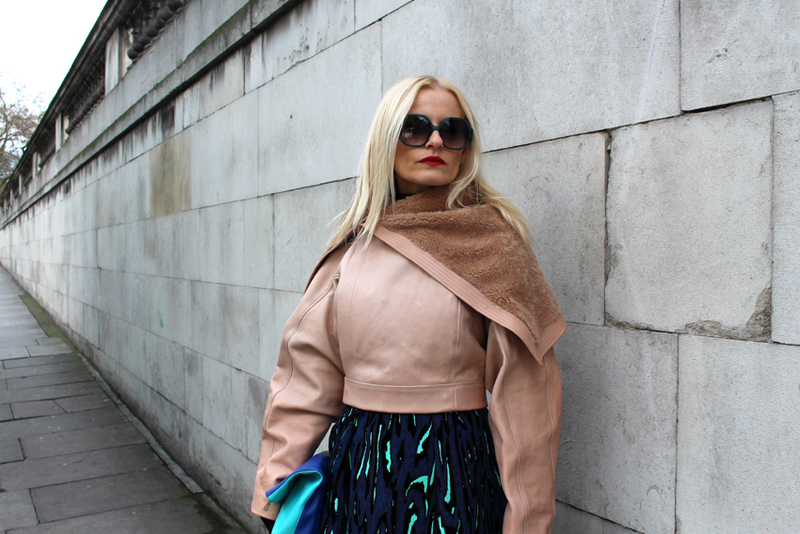 Here is a what I wore to the final day at London Fashion Week. 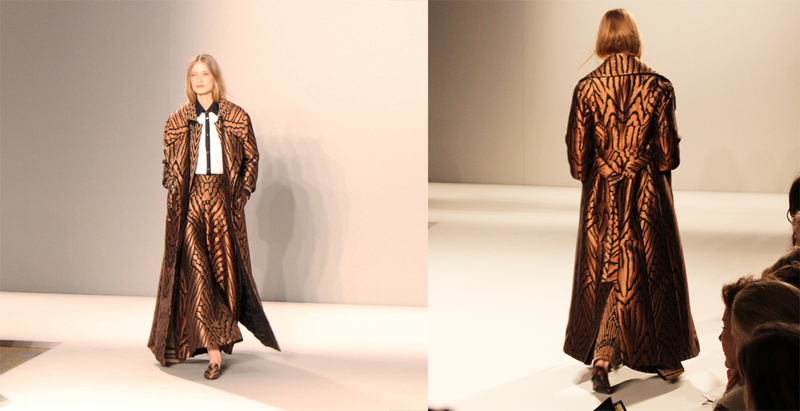 I fell in love with this Duro Olowu Shearling-trimmed wool jacket when I saw it on the Outnet sale. 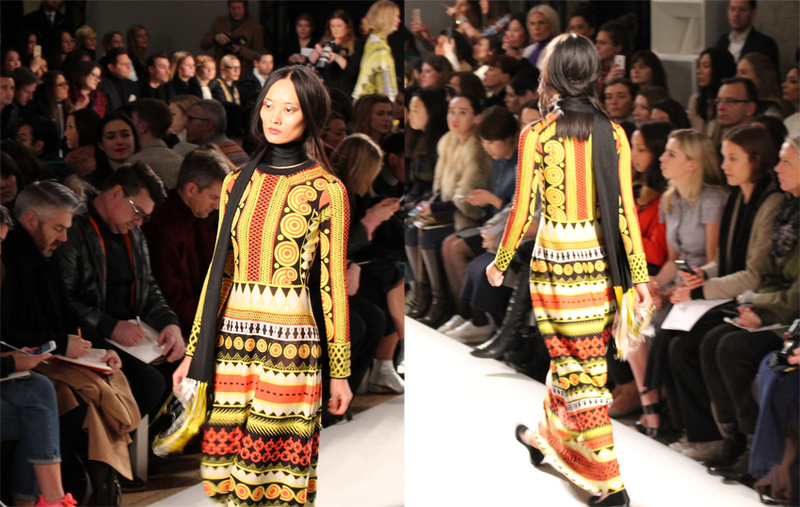 Duro Olowu is a new designer in my wardrobe. Since 2004 when he launched his London label, Nigerian-born Duro, has been wowing with his signature kaleidoscopic and clashing prints full of energy and movement. 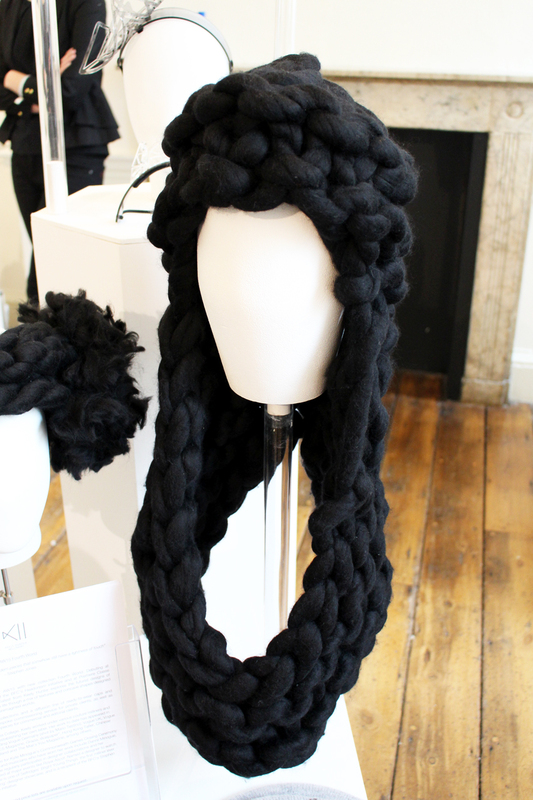 I love the fluffy Mongolian-style lamb shearling and sleeves crafted from panels of black wool and monochrome bouclé. Very chic! I teamed it up with Alexander Wang pleated leather mini skirt. I am a die-hard Wang fan and must admit, this skirt is not only just drop-dead gorgeous to look at but you also feel fabulous wearing it! 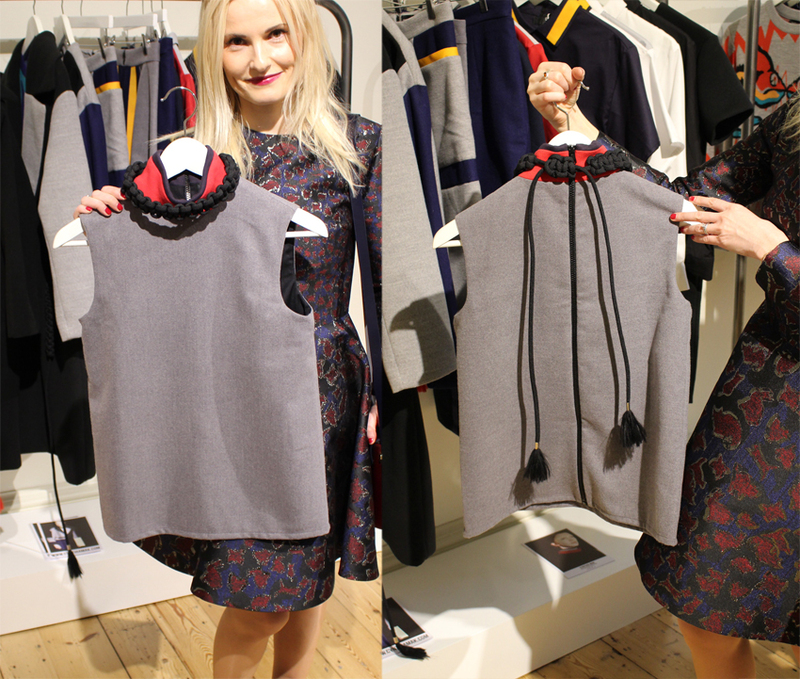 I just adore the gunmetal/licorice colour and heavy leather structured feel with strong pleats thought-out the front. Masterpiece! Now, when it comes to boots – no one does it better than Alexander Wang. 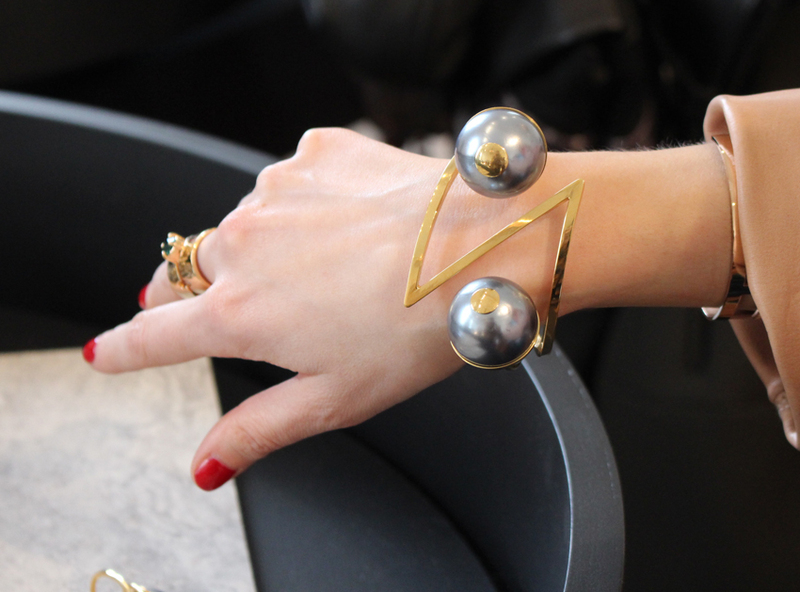 When NET-A-PORTER had a sale earlier in a year, I knew I had to have them! 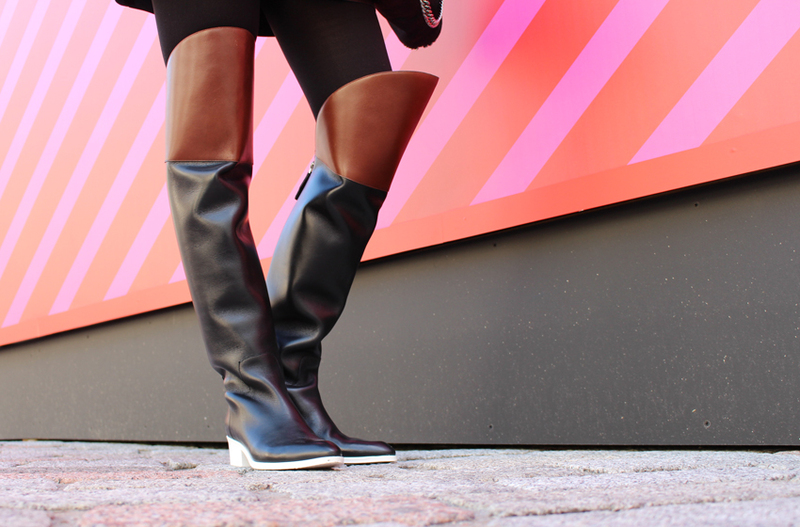 Worn on the runway at New York Fashion Week, Alexander Wang’s ‘Lovanni’ two tone over the knee boots are one of a kind! With a contrasting slick black and chocolate brown leather, zipped at the back, giving off the classic equestrian feel and comfortable stack wooded white heel that adds an off-beat, contemporary edge making it so easy to walk the city streets, why not make blustery mornings a total pleasure! I finished off the look with the iconic Stella McCartney Fabella faux-leather shaggy deer black fold-over tote with ruthenium chain hardware. 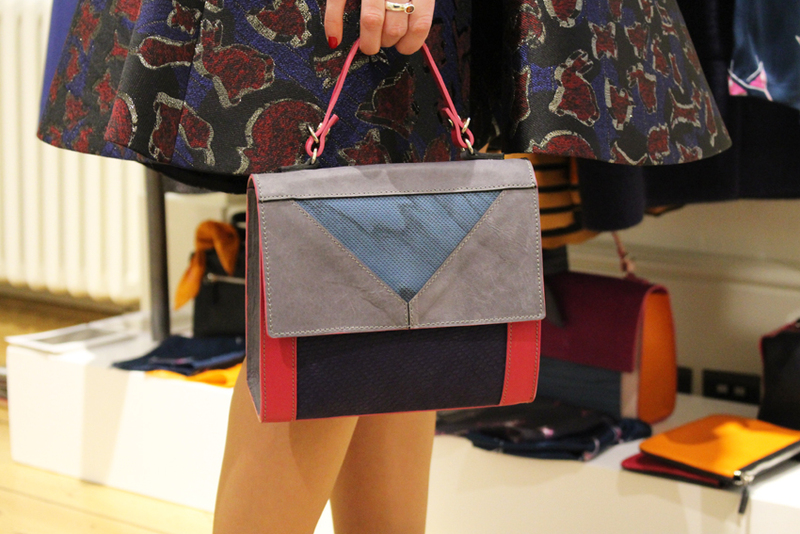 I love the fact it can be worn in two different ways – folded over as a shoulder bag or a as a handheld tote! Only these funky Fendi Havana tortoiseshell oversized shades to put on and off I go! Let me know what you think about this outfit! 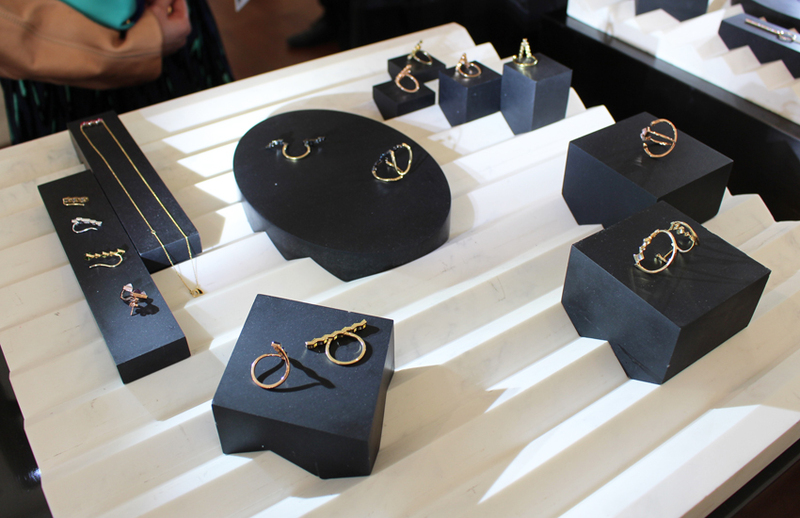 I love jewellery as much as I love clothes, so when I visited the Jewellery Designer Show Rooms during London Fashion Week back in February, it was a feast for the eyes! 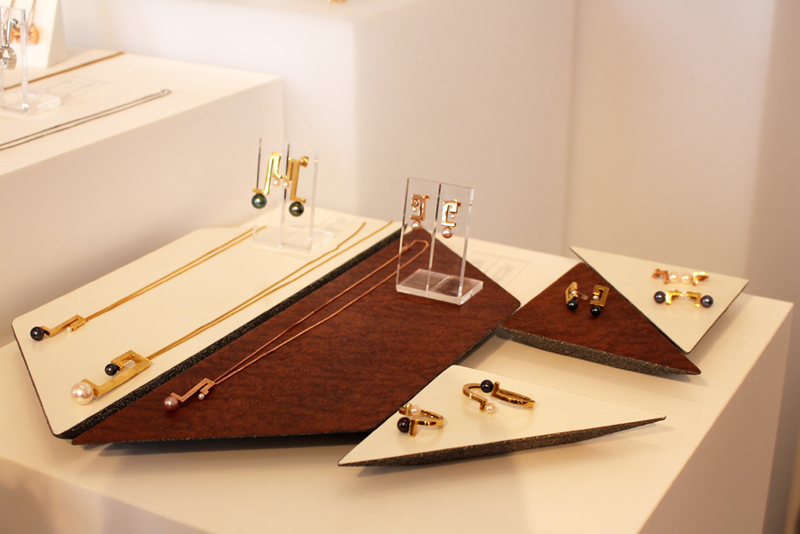 KATTRI is a contemporary jewellery brand set up by Amanda Debrasi whose designs aim at creating beauty and richness by mixing simple lines and pure shapes with gems at the focal point. 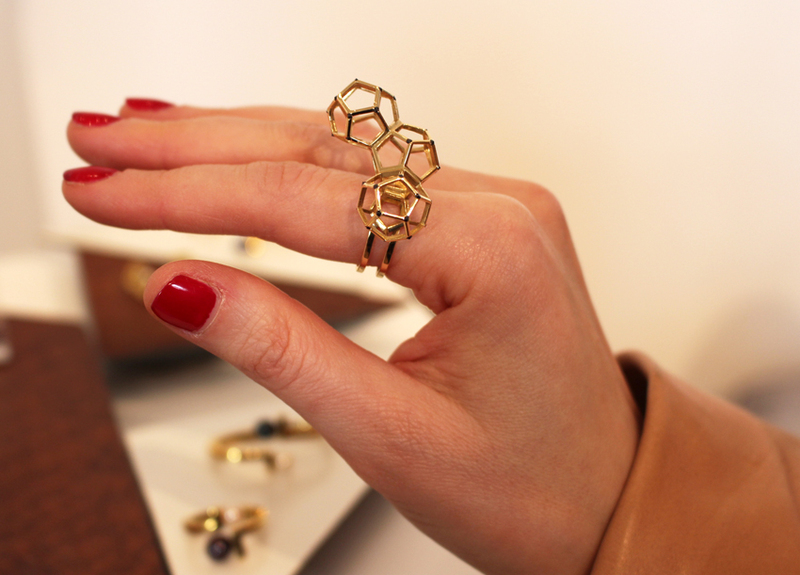 I adored this multidimensional Triple Dodecahedron Ring made of 18ct gold and black diamond. So eclectic and eye catching! 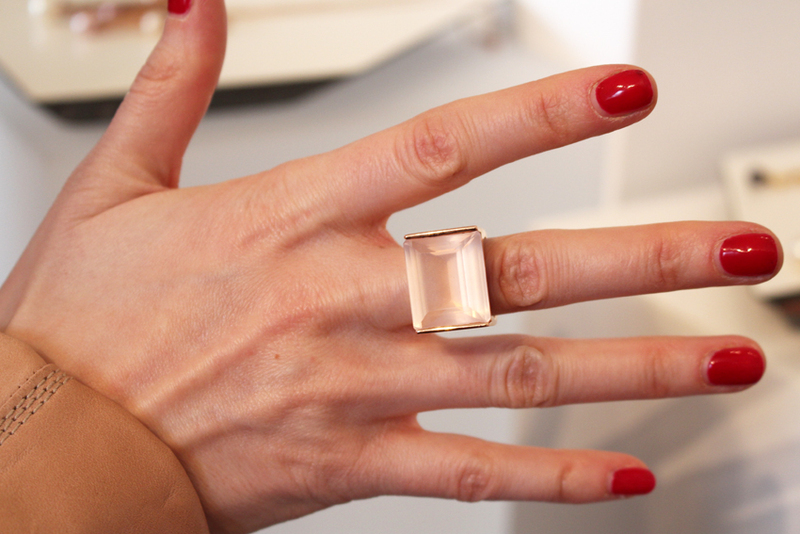 One of my favourites was the Qudrant Short Ring made of 9ct Rose gold and rose quartz. 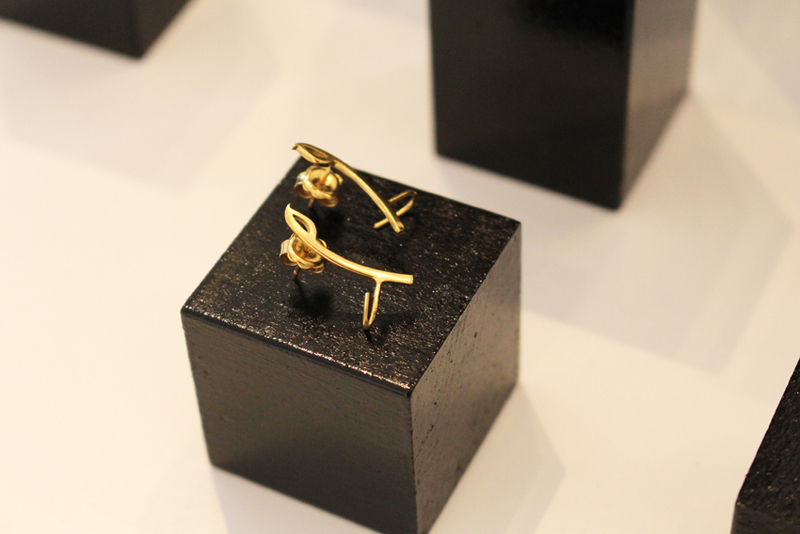 LILY KAMPER is another jewellery designer whose designs are both captivating and very wearable. 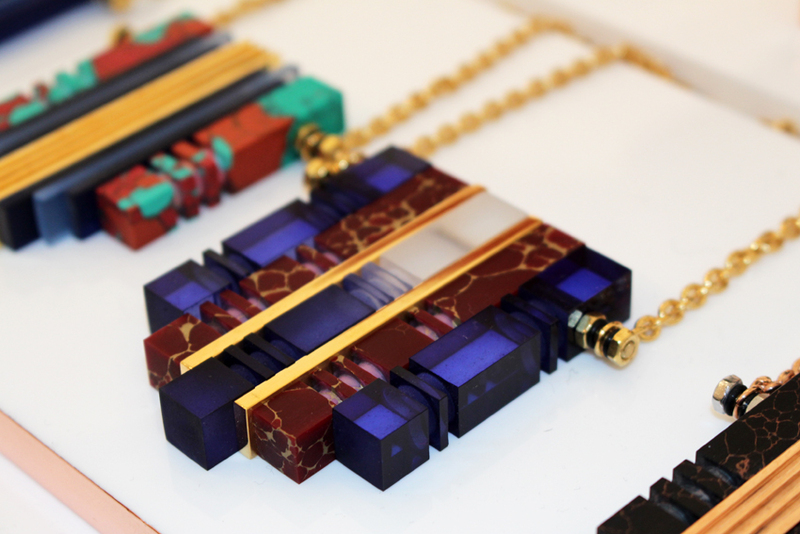 After graduating from London College of Art, Lily set up her London based brand that reflect her love for colour and unusual material blends embodying modern luxury. 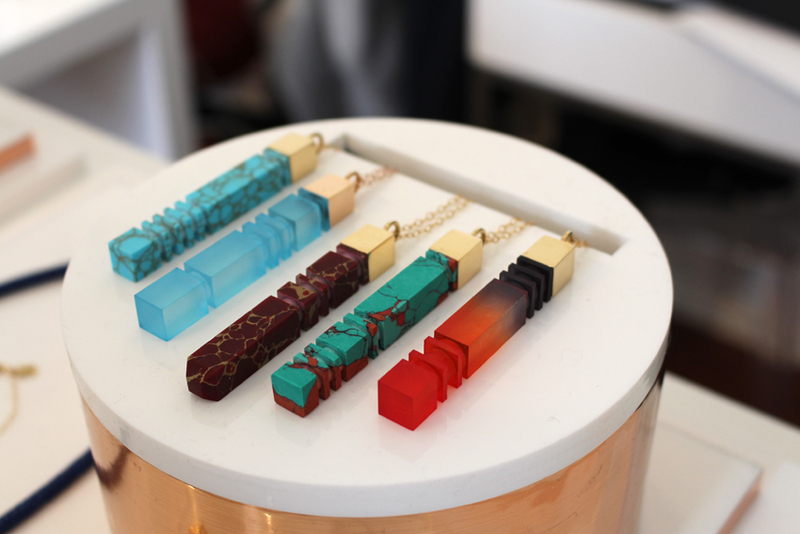 Each piece of jewellery is hand-turned on a lathe from blocks of resin and Perspex. 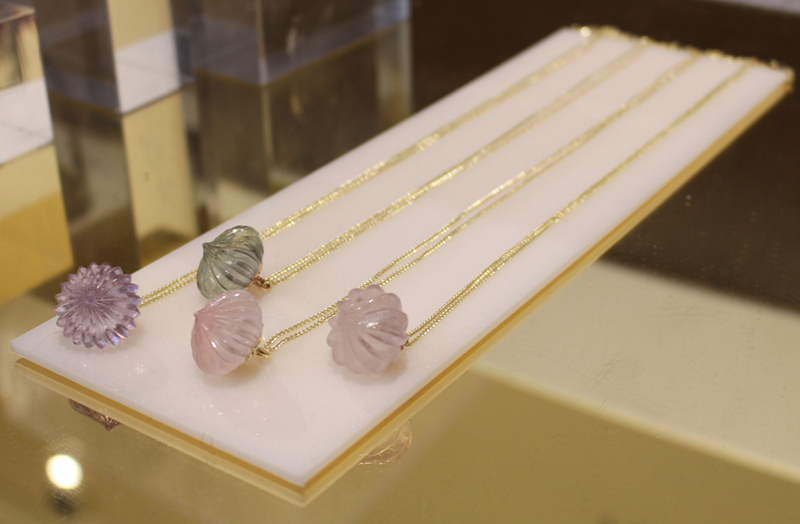 The fine jewellery pieces are all set with white, blue and pink sapphires and each season a new exclusive solid stone column is added to the collection. 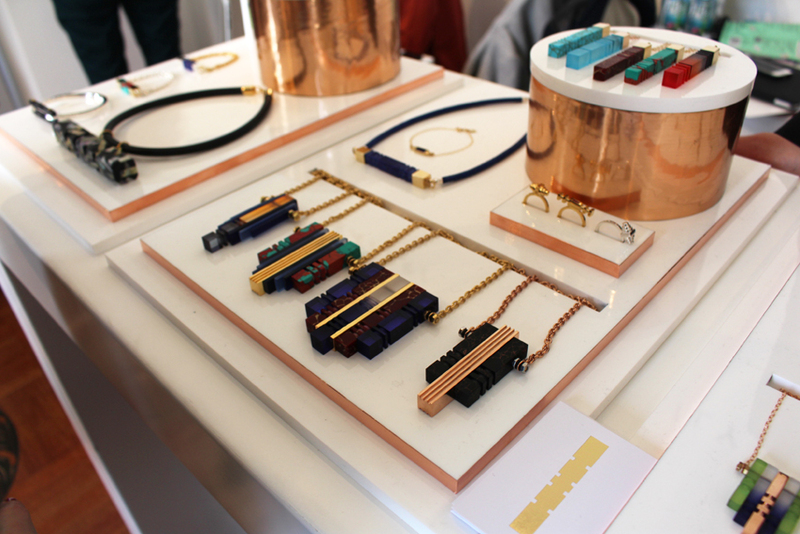 I just could not get enough of the striking colour combinations! Stunning! 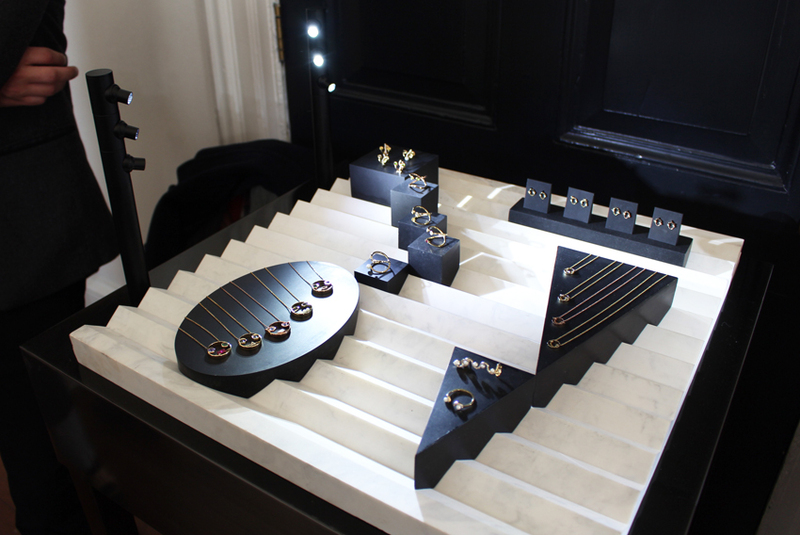 Lily Kamper‘s Jewellery is stocked globally from Liberty in London, Colette in Paris to the new Harvey Nichols in Azerbaijan. Lily has also been named one of the Professional Jeweller Hot 100 in 2014. 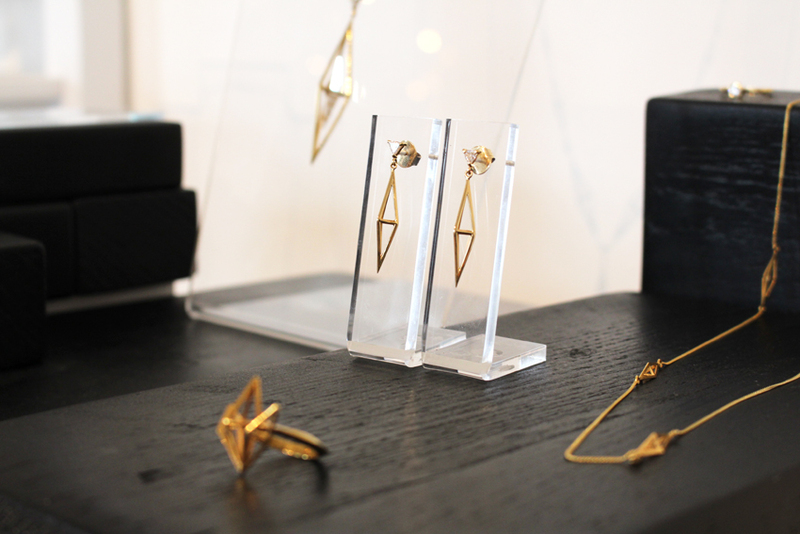 BAM-B is a contemporary jewellery brand co-founded in London by Brittany Glossop & Caitlin Briody. 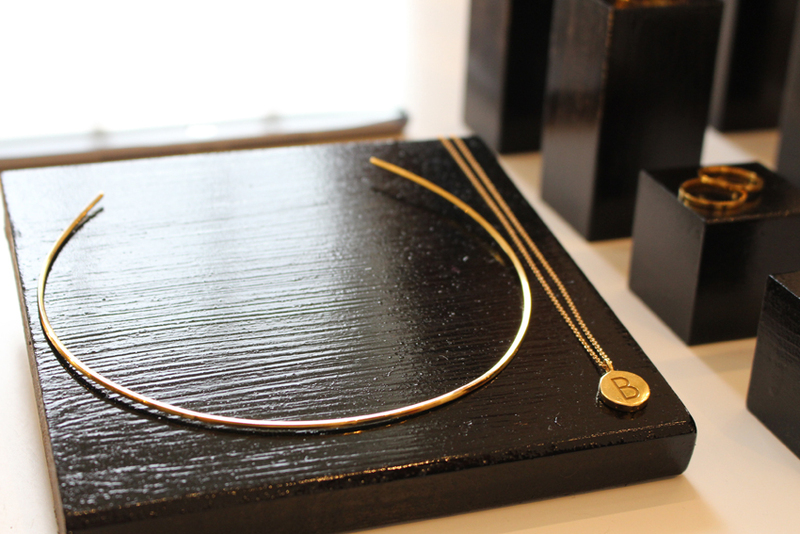 This beautiful, clean and minimalistic jewellery, handcrafted using premium materials, and attention to detail, combine classic, long-lasting design with a modern luxury touch. 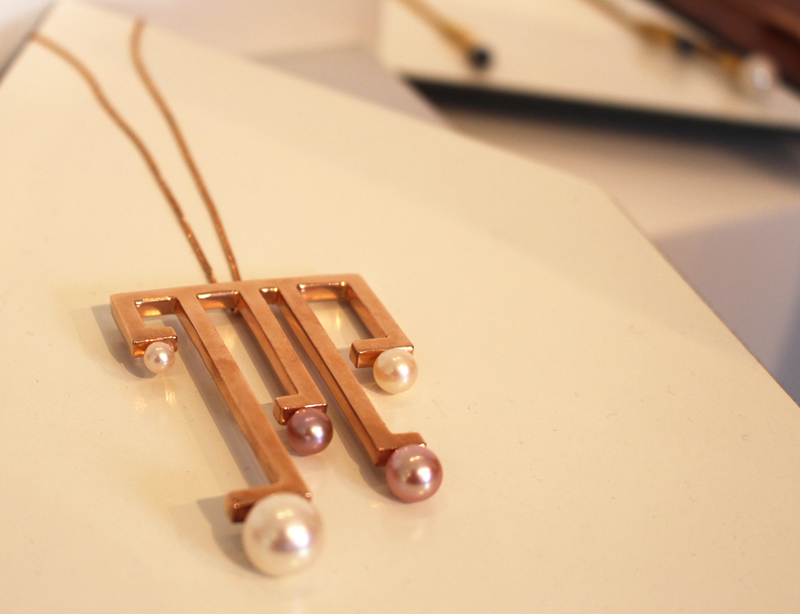 Collier Pétale. 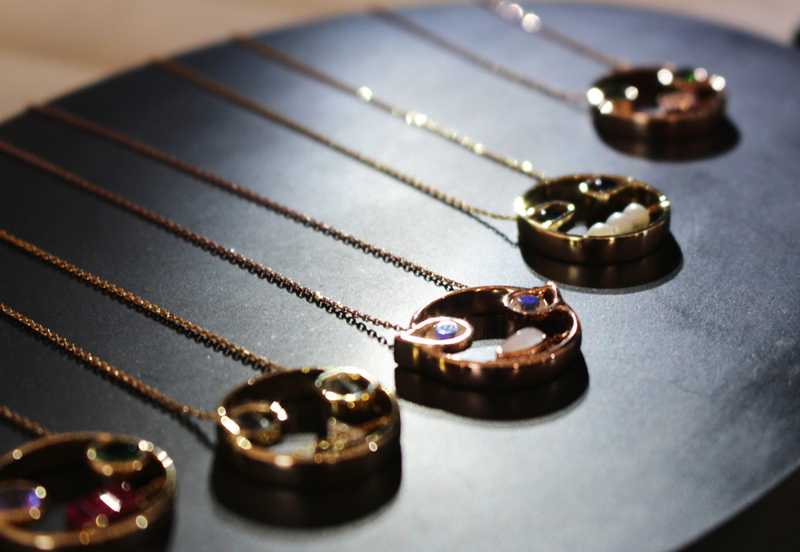 7 necklace made of sterling sliver and plated in 18ct. 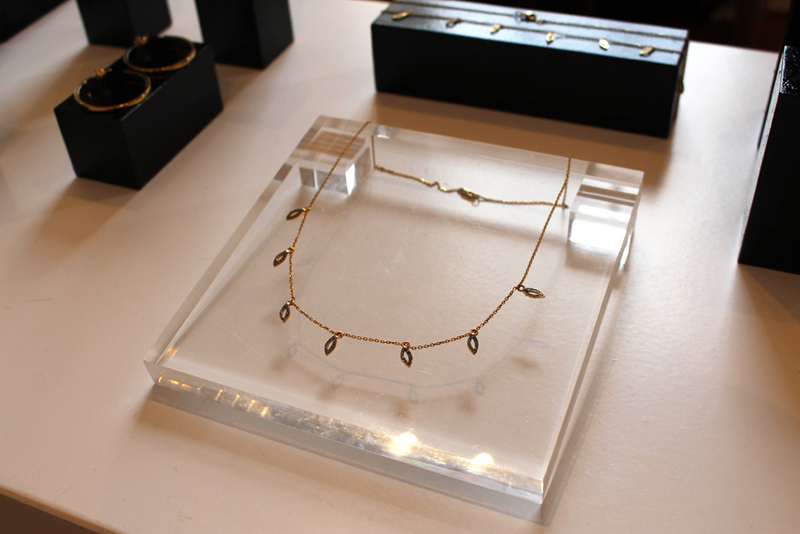 Gold stood out from Ptéale Collection. 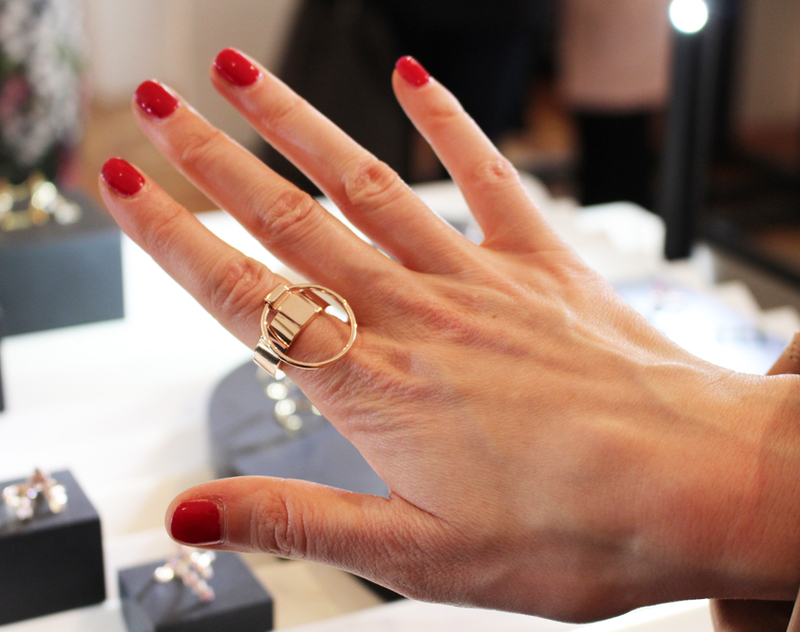 I loved this Pétale 2 ring with a feminine floral design from AW15 collection featuring two petals in an architectural positioning. 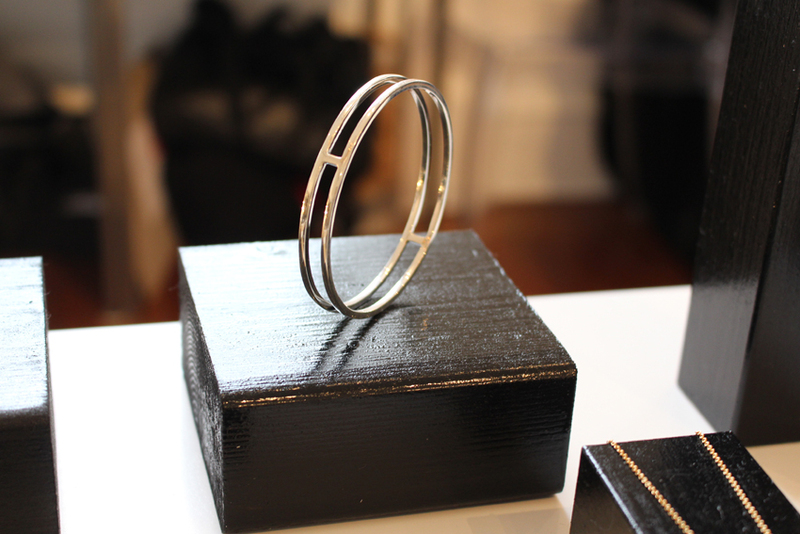 I am a fan of silver so this Square cut double strand bangle in 925 Sterling Silver struck a cord with me. 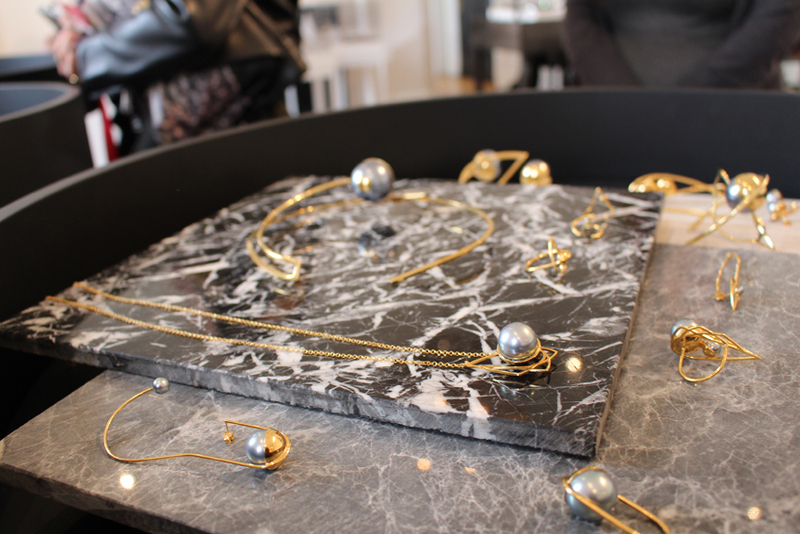 Melanie Georgacopoulos is yet another fine jewellery designer who, with her M/G collection continues to explore the endless aesthetic possibilities of the pearl as the epicentre of the modern woman’s accessory. 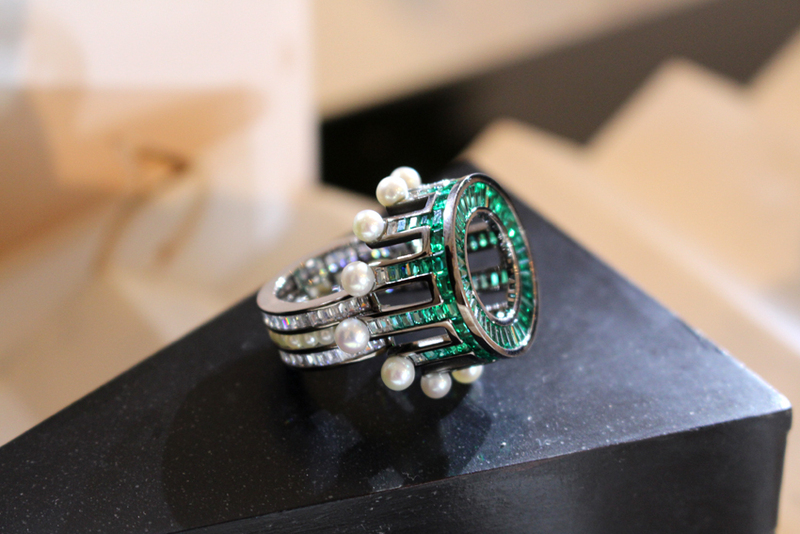 Seemingly vulnerable and feminine yet tough and enduring the pearl’s symbolic contradictions are poised throughout each collection to create contrasts of texture and feel, toughness and volume. Her designs are certainly very wearable and ageless! 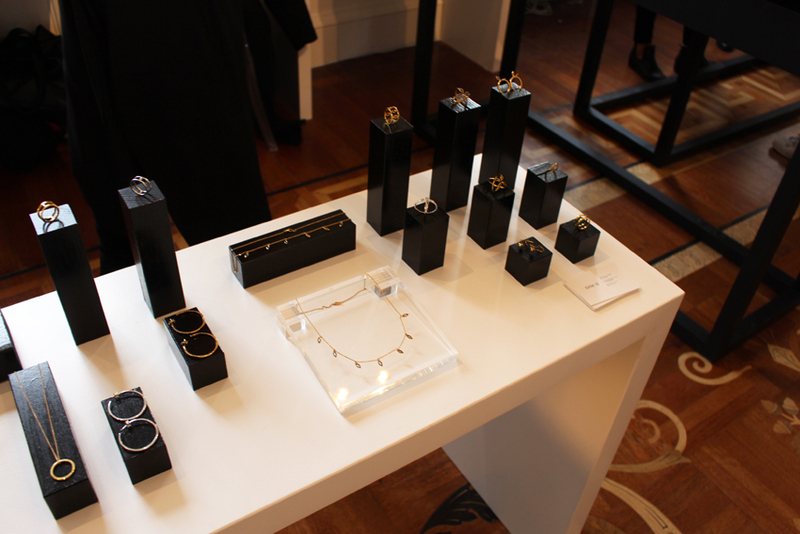 RUIFIER is a Fashion led Fine Jewellery founded in London by designer Rachel Shaw. 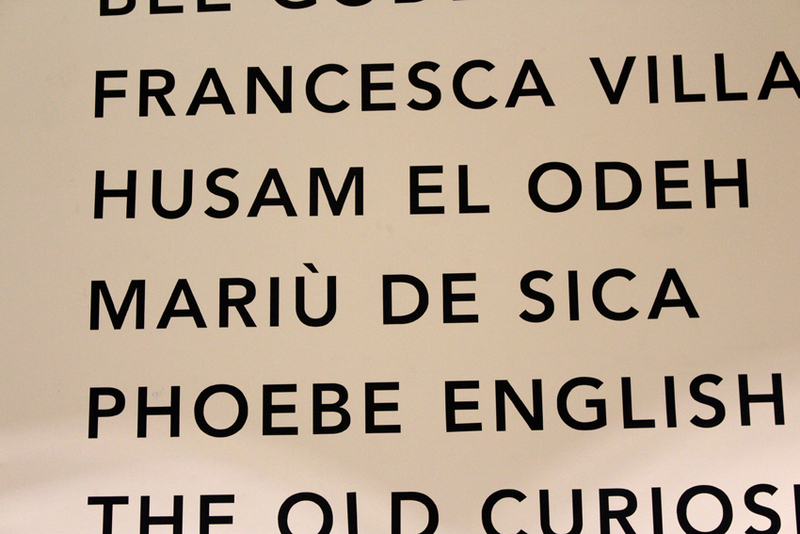 The name is derived from the word ‘Reify’, which means “to make a concrete object from an abstract idea”. 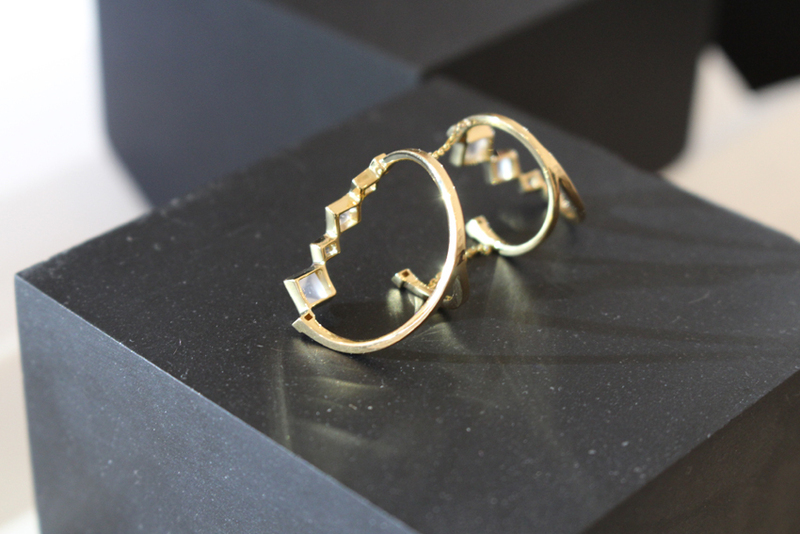 Rachel takes inspiration from her love of graphic shapes, anything from natural world to urban landscapes and her collections epitomise jewellery made for all occasions, combining innovative design with superb craftsmanship, worn individually or layered in the array of ways, RUIFIER represents timeless jewellery designed to be treasured and admired. 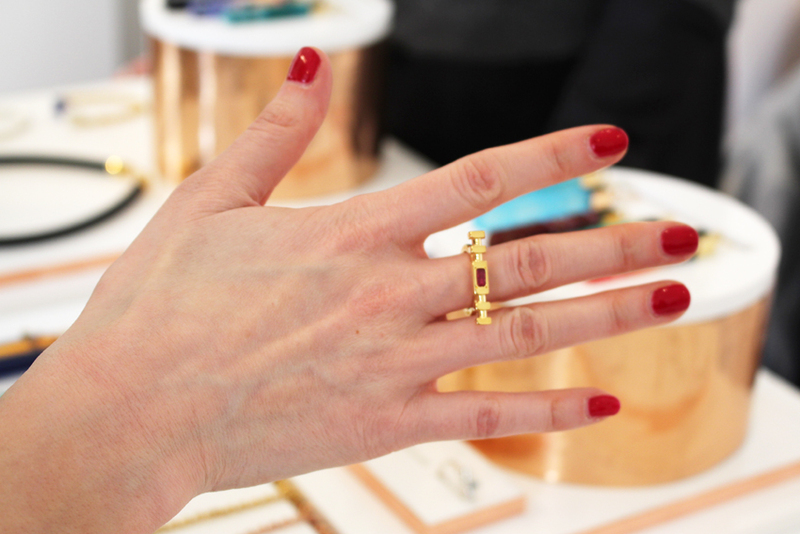 I fell in love in this Rose Gold Icon Ring – a statement piece from the Icon Collection, perfectly geometric, this bold design compliments all styles. 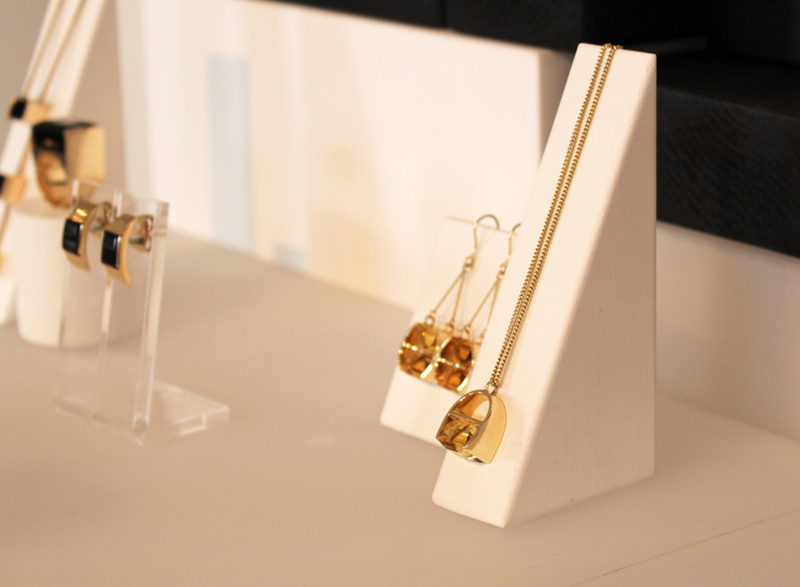 These Icon Fine Drop Earrings also caught my eye! 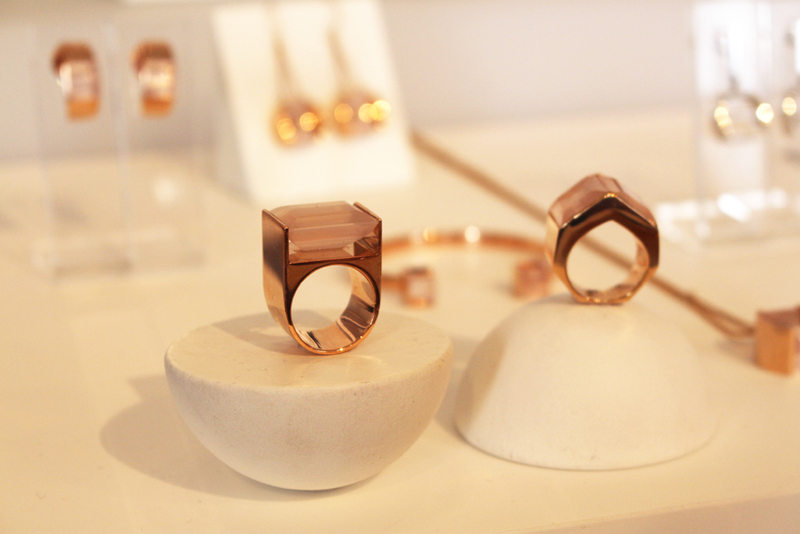 The classic shapes of the Icon ring are here reinvented in the warm hues of rose gold with graduated brown and white diamonds. 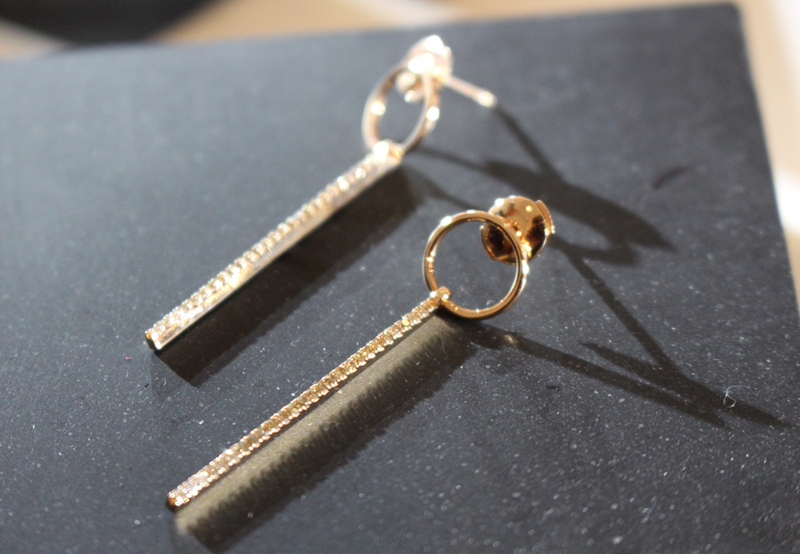 Elegant and luxurious, the earrings glitter in the light for the ultimate, unassuming glamour. 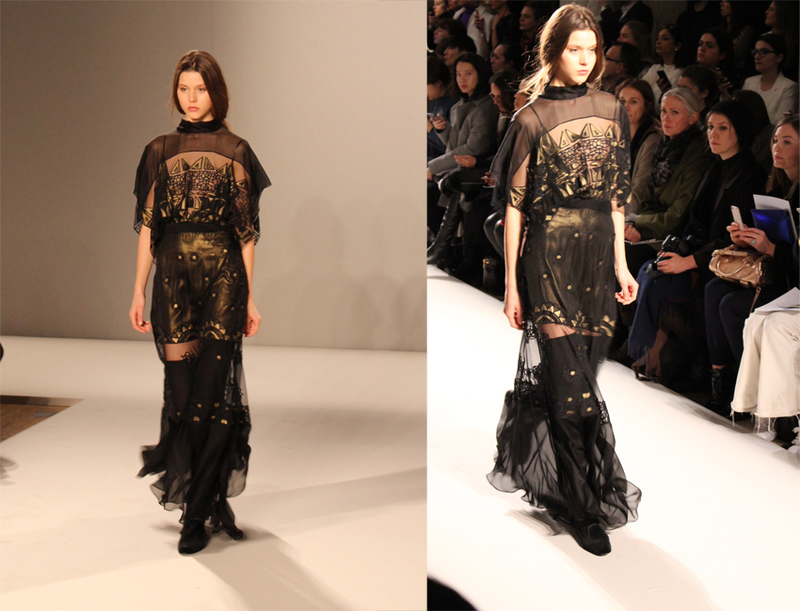 I love structured shapes and this is exactly what I went with for the third day at London Fashion Week! It definitely paid off, just check out the Getty Images feature! This stunning Mary Katrantzou Silk Blend Animal Print Jacquard dress I picked up on TheCorner sale is one of my favorite pieces to date. Inspired by the signature fifties New Look silhouette and styled in deep shades of jewel-toned jacquard, Mary Katrantzou‘s A-line dress is certainly a feminine choice for dress-up. 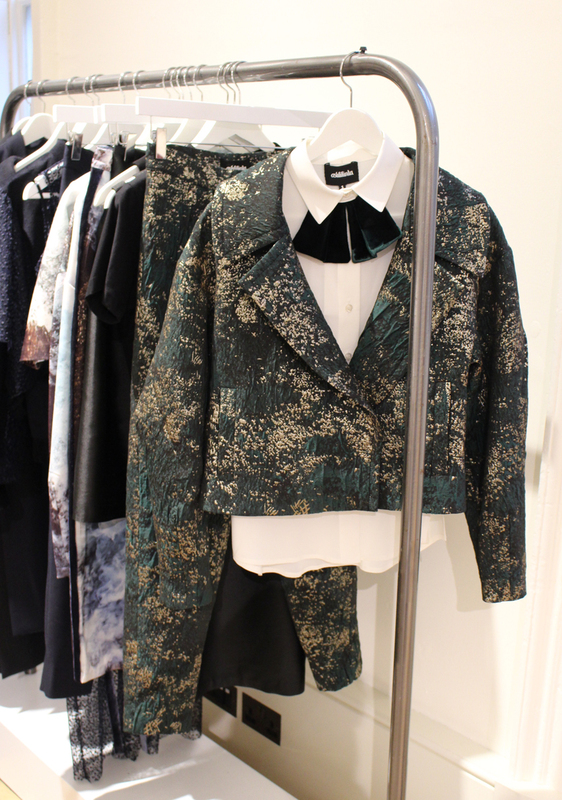 Covered in abstract animal patterning, this shimmering piece lends evening looks a touch of whimsical. 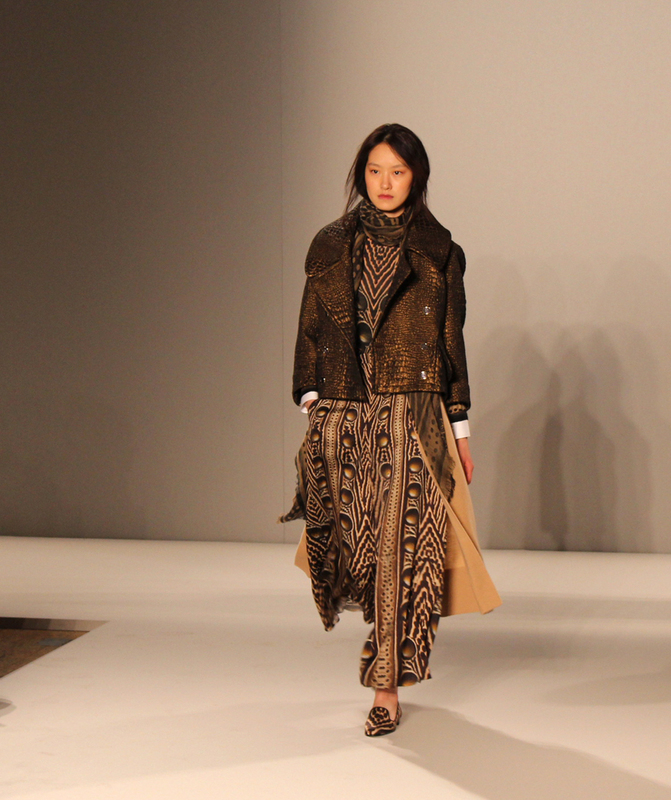 I love the ink/black silk blend with bordeaux and silver-hued jacquard pattern. To add a notch of modern classics I matched it with Acne Studios Mape Shearling-trimmed leather biker jacket from Net-a-Porter. Designed with a detachable, plush stone lamb aviator-inspired shearling collar, rough downtown-luxe hardware and a chunky buckled belt, is one of the most coveted wardrobe staples among It girls. I love slightly boxy cut and the asymmetric zip. I was aiming at that extra edge so slipped into these gorgeous Alexander Wang Lys polished leather ankle boots, also from Net-a-Porter. Not only does Wang create most coveted accessories each season, but this time he also incorporates the runaway’s utilitarian feel injecting a dose of futuristic style into otherwise, daily-wear pieces. 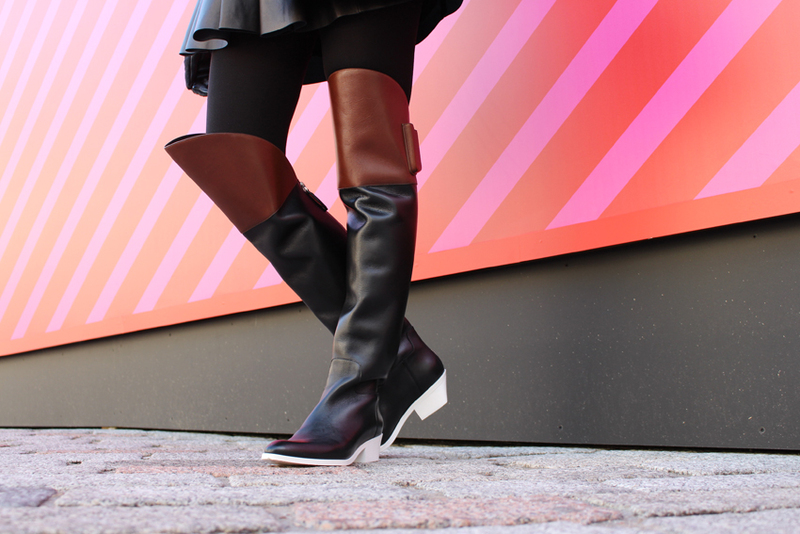 These super cool Lys boots are crafted from polished-leather with an exaggerated, shield-like front panel. 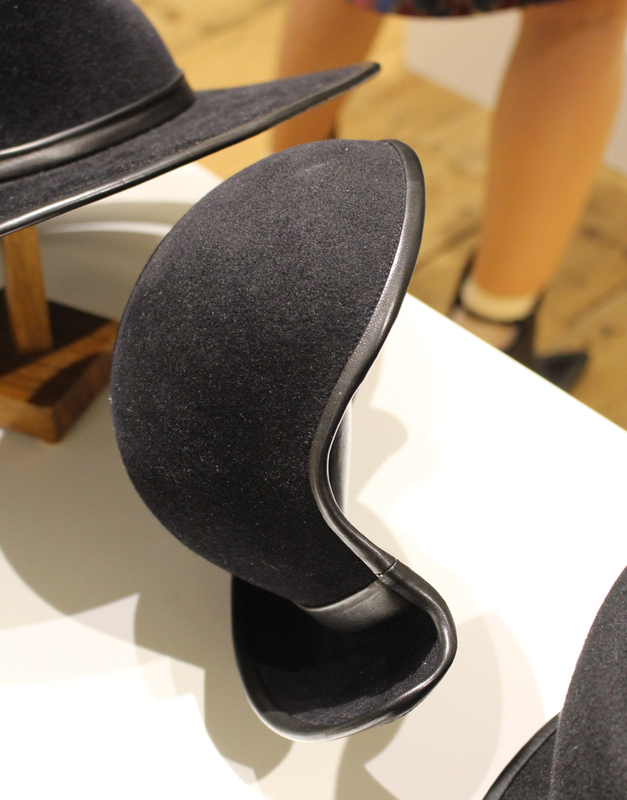 Finished with a well-balanced ostrich-effect heel, this backless, gorgeous pair look best with shorter hemlines. I accessorised with the cute cream socks to offset the black sheen of the ankle boots, Jaeger black ponyskin gloves and Fendi sunglasses. 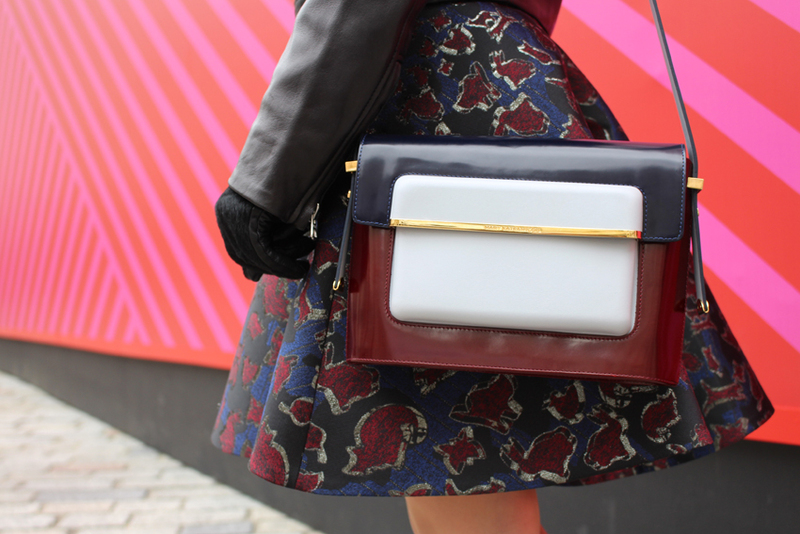 Of course, I cannot forget to mention the fabulous Mary Katrantzou glossed MVK medium cross body bag! 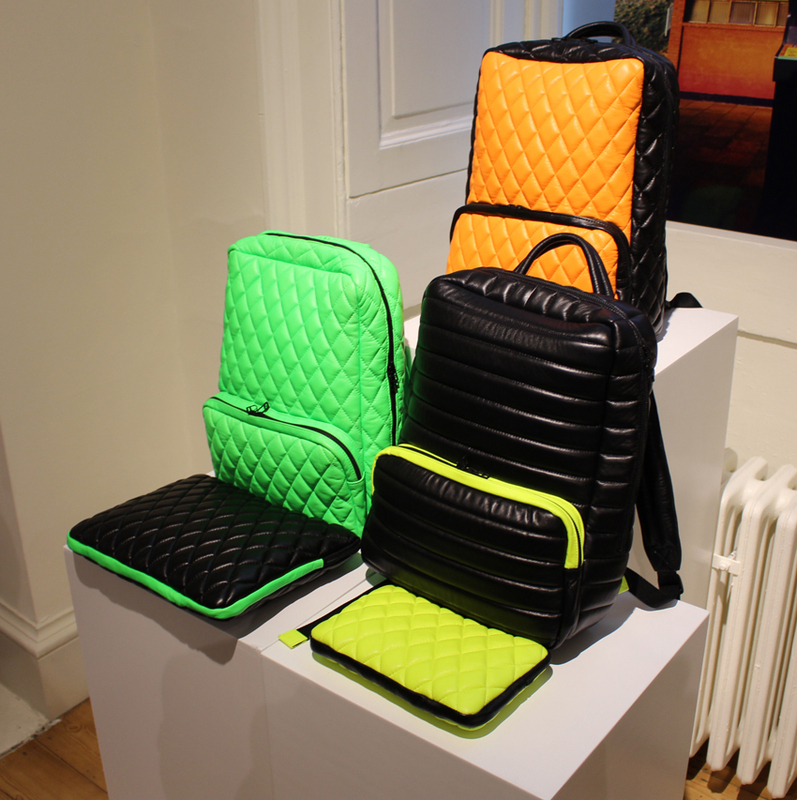 The design behind this bag is truly genius, it is different to anything else I have seen. I love the way the flap comes over the bag like a lid closing the box off. 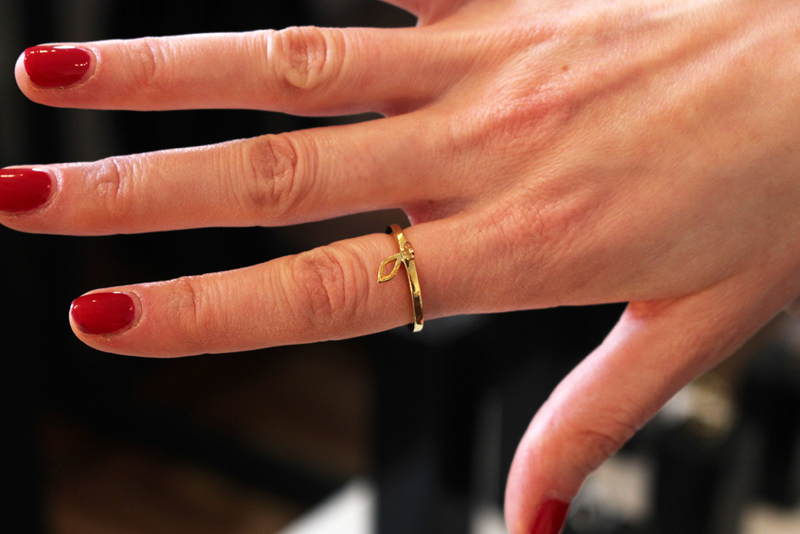 The structured shape makes it ideal for on-duty dressing, so you can style it with silk blouses or statement dresses. This timeless bag is a true homage to understated luxury, featuring panels of super clean colour-block leather and a sleek magnetic gold-tone clasp. Geometric masterpiece in my favourite hues of navy and burgundy. Like my style? Why not sign up for my weekly updates! I have finally recovered from the nasty flu that held me home-bound for the last two weeks (hurray!) 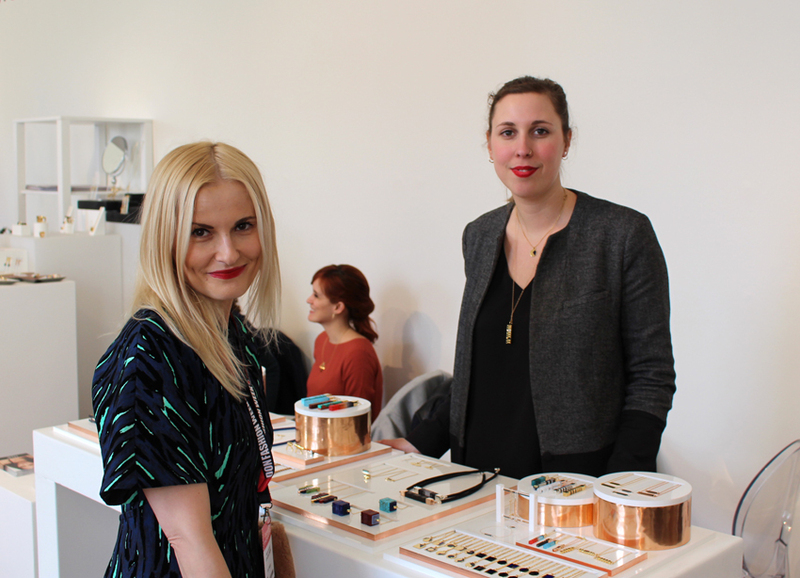 so it is about time to have some fun and rave about all those amazing brands I met at London Fashion Week in the Designer Showrooms a few weeks ago! 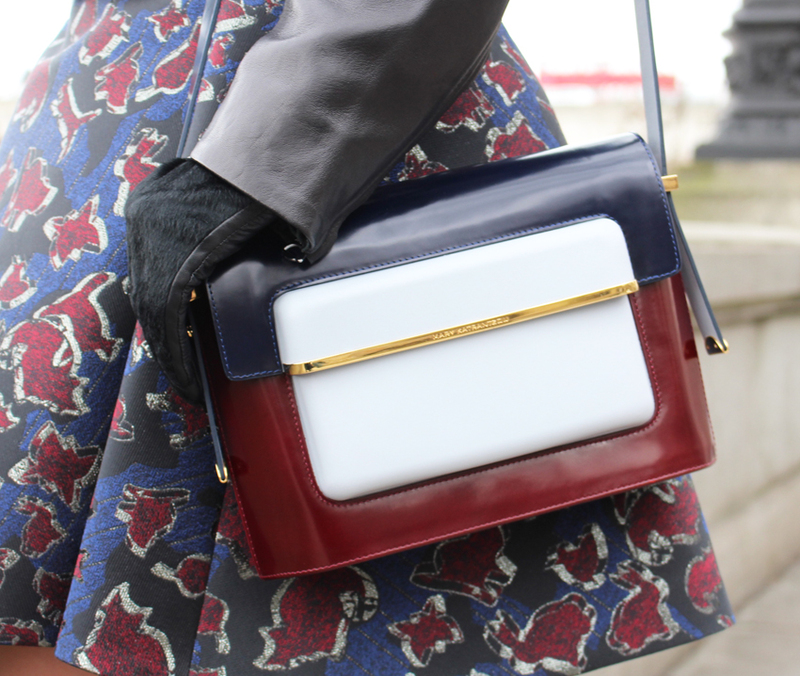 I wore Mary Kantratzou designs, both dress and the handbag – the outfit details will be shared in my next post, though! 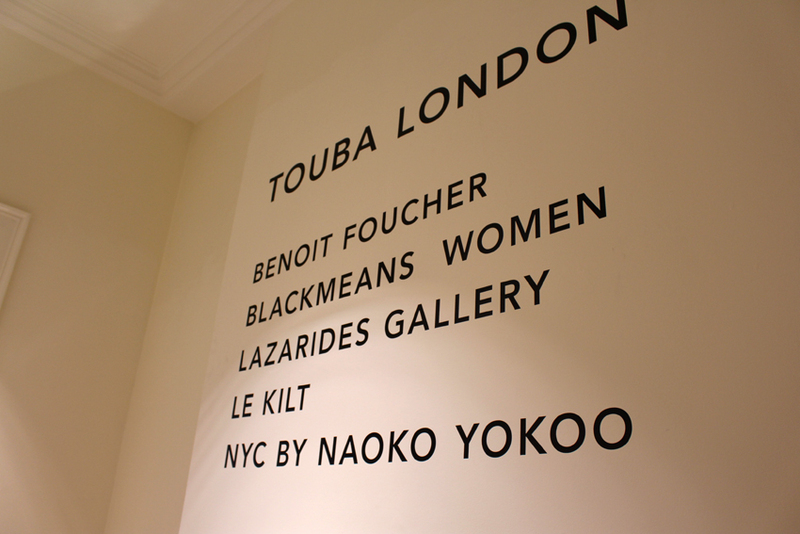 I had an opportunity to speak with Fode Sylla and Yuko Fujita – founders of Touba London – a PR platform for British and International up-and-coming brands to showcase and promote their creativity and designs in the areas of fashion, photography and artwork. 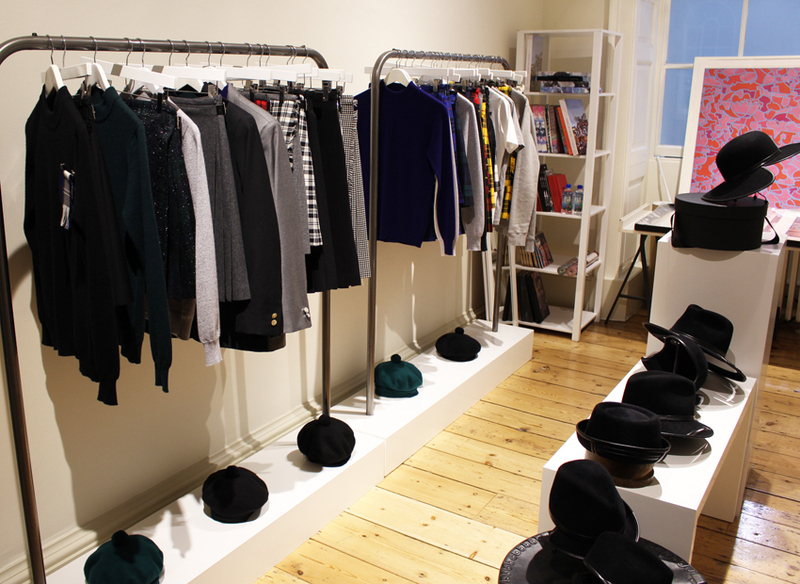 Their showrooms in London, Paris and Tokyo are a home for striving fashion designers as well as photographic and artwork exhibitions leading to the international market recognition. 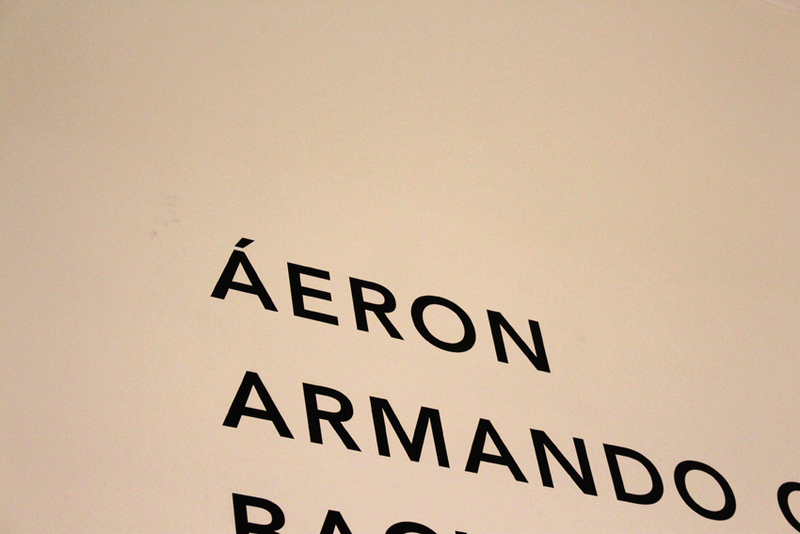 There was a number of brands that caught my eye – one of them was Áeron – a Hungarian label set up by Eszter Aron in 2011 whose designs are characterised by sharp lines, focus on fabric quality and innovative craftsmanship. The core of Eszter’s inspiration and designs lies in minimal yet feminine sensuality, keeping that perfect balance between work and play while reinventing traditional tailoring. 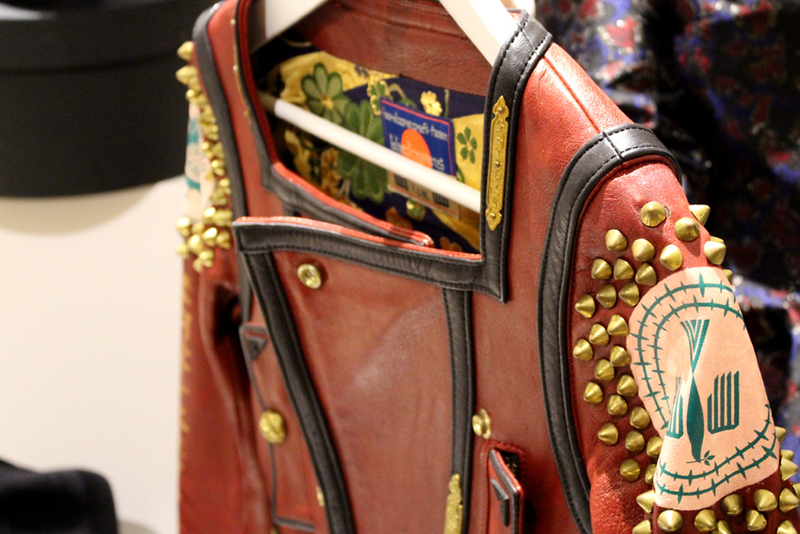 I absolutely loved her signature suede Japanese leather designs that ooze class and sophistication. 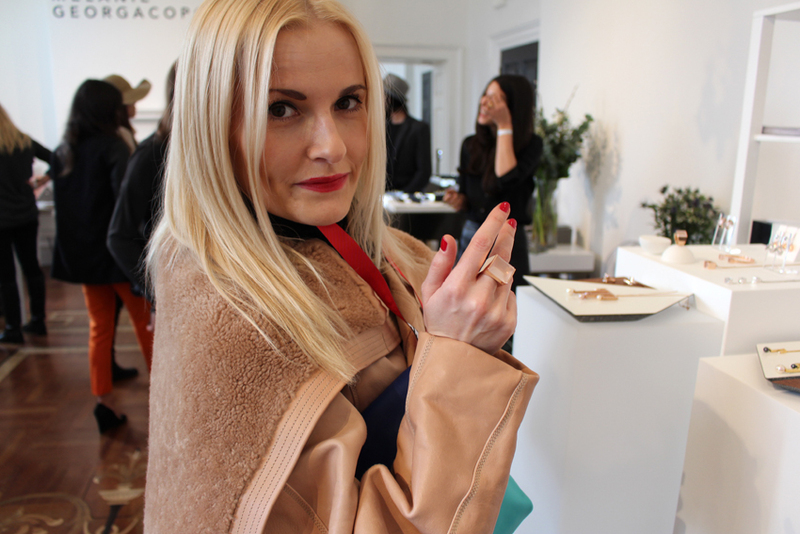 Amongst my favourite pieces were asymmetrical coats, oversized sweaters and minimalistic dresses. 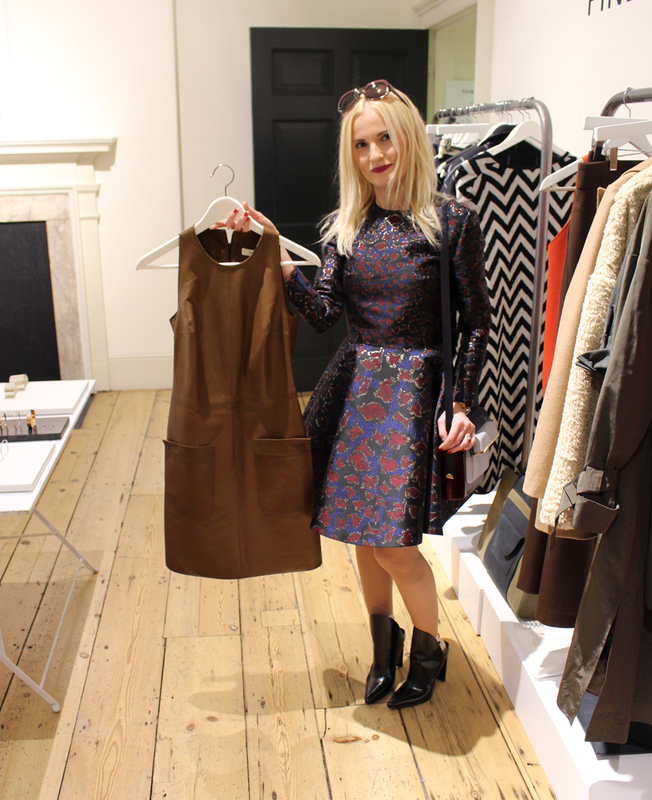 I adored Cyntha & XIAO‘s collaborative AW’15 collection featured at Touba London. 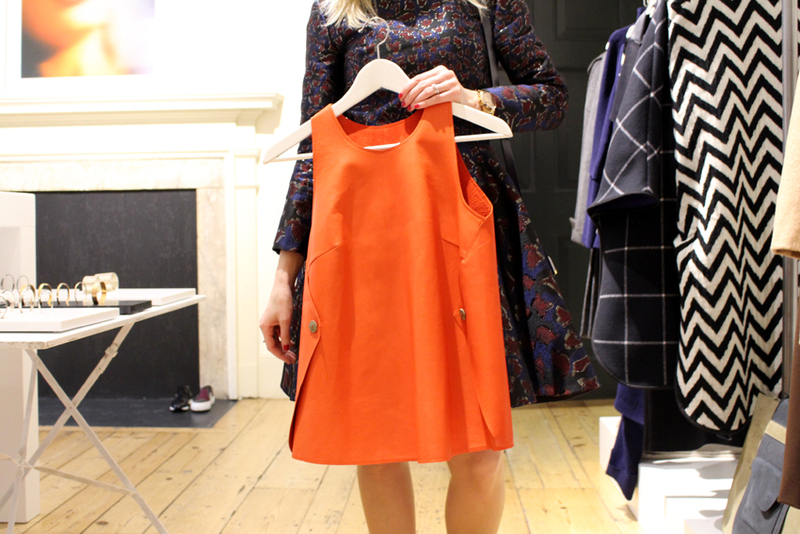 I love colour blocking so their amazing dresses and knitwear really captivated my imagination. 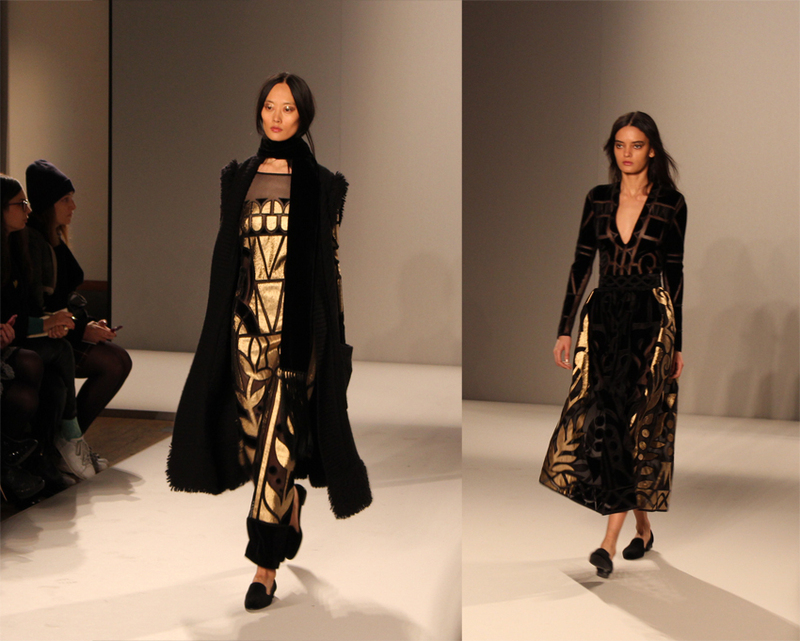 Both Xiao Xiao & Cyntha Mak are Central Saint Martins‘ offsprings. Hong Kong-born Cyntha was named by Italian Vogue as a designer to watch out for and included her in their list of “New Talents”. Having worked with the likes of Roksanda Illinic, Alexander McQueen, Vivienne Westwood, Preen by Thornton, she then returned home to Hong Kong where she is now based. 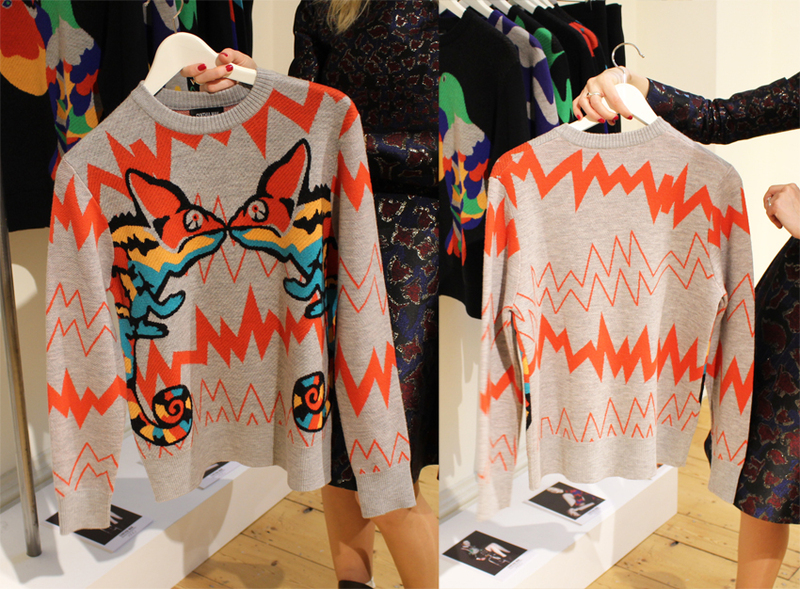 Her brand, set up in 2014,“is founded on bold graphics infused with strong modernity” and her graphic background shines though in the AW15 collection. 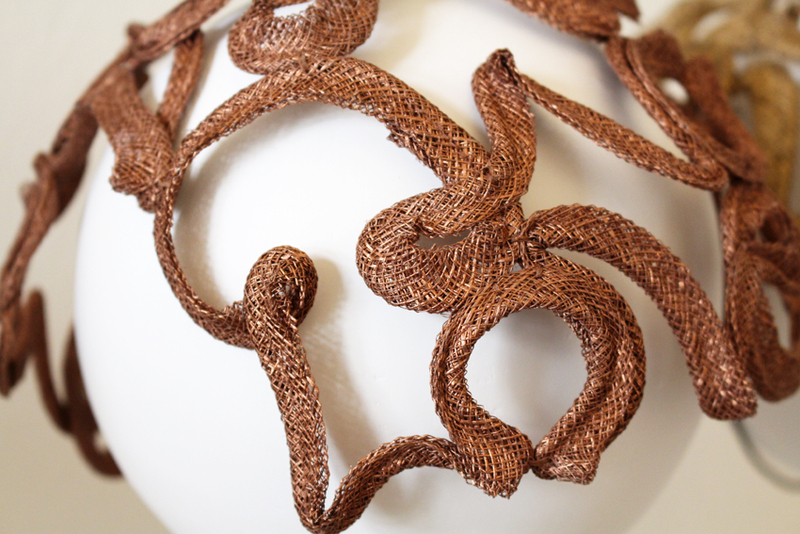 Xiao, who was born in Beijing, initially studied fine art and textiles before combing her artwork with fashion design. 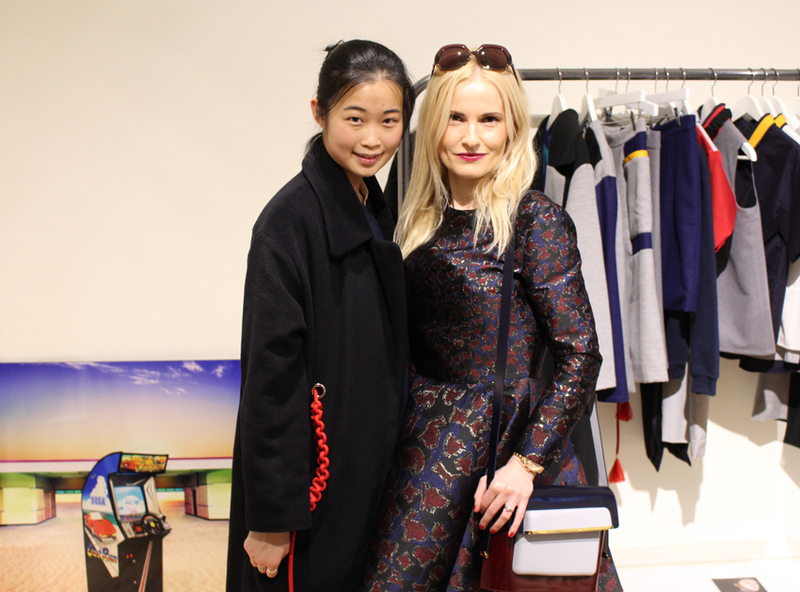 After graduating from CSM she moved back to China to launch her own label. Their collaboration incorporates functionality with a edgy masculine present in oversized collars, utilitarian pockets, and striking knot detail. 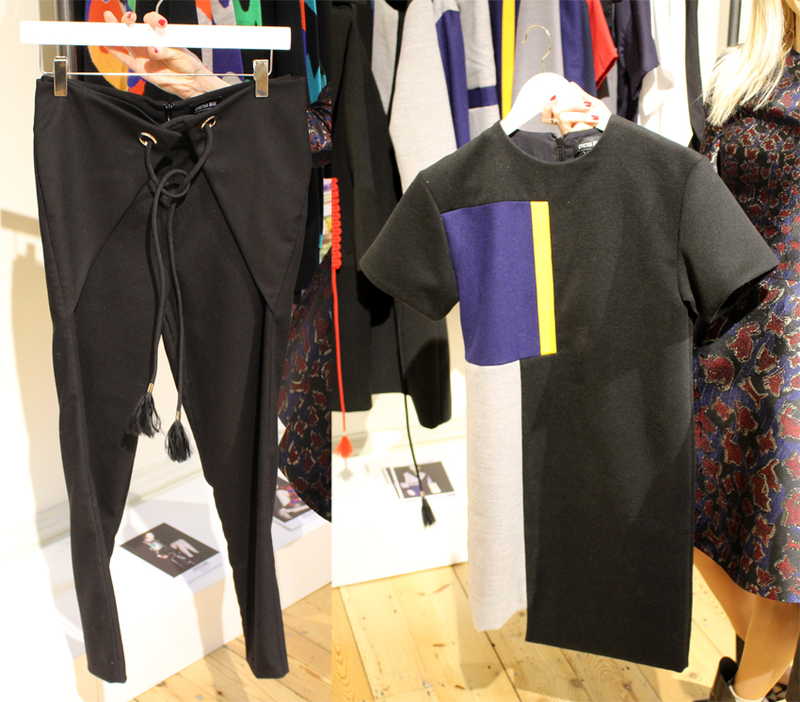 Both designers bring the idea of bold basics to her SS15 collection utilising classic 50’s shapes and patterns in a striking manner. 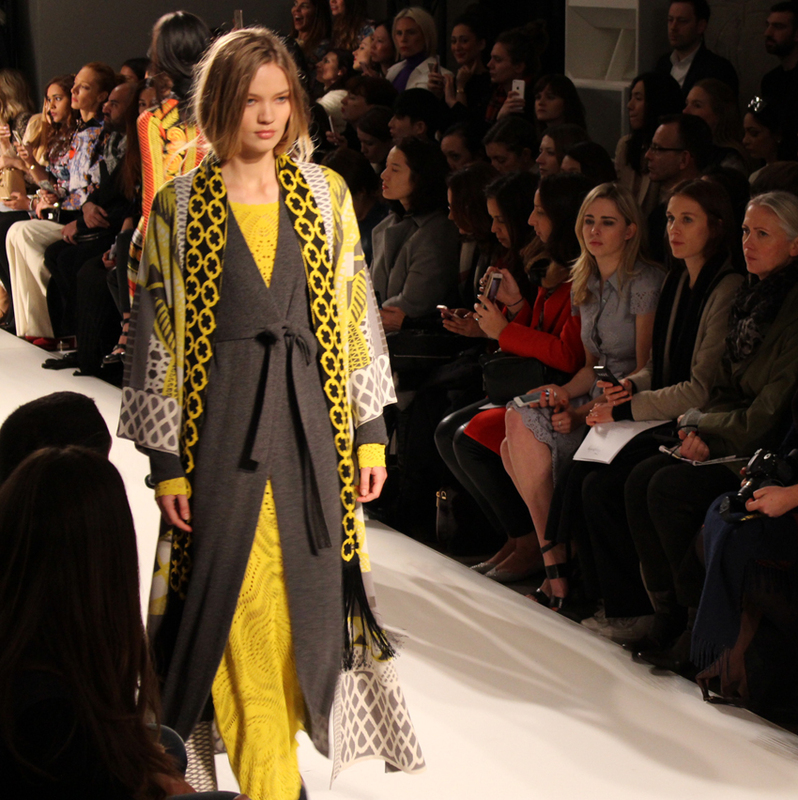 Cyntia & XIAO delivered a fresh looking collection where beautiful fabrics and colour are at the very forefront. 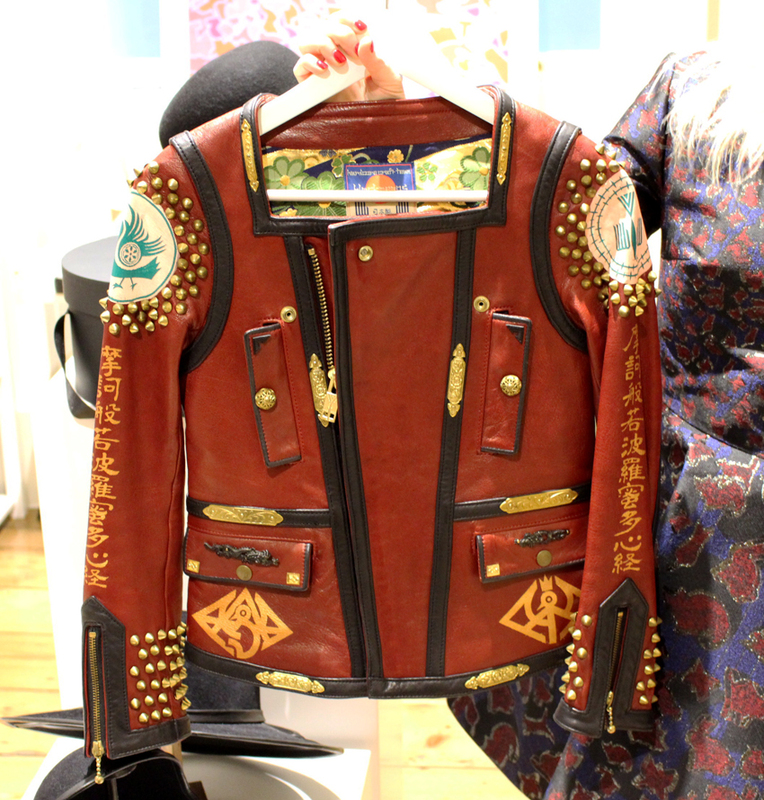 Blackmeans Women – a leather brand lauched in Tokyo in 2008- showcased fabulous leather jackets inspired by Japanese hard-core punk, tribal features, motorcycles style and high fashion. 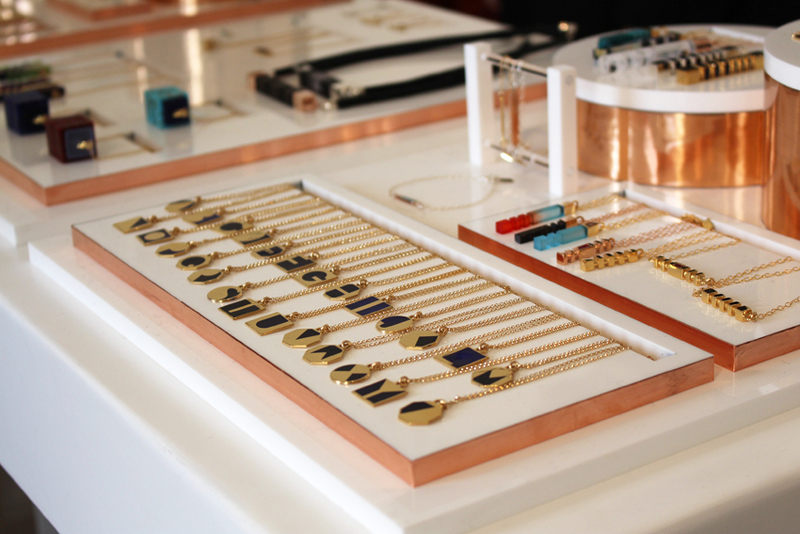 The brands shouts avant-garde, charisma and free style. 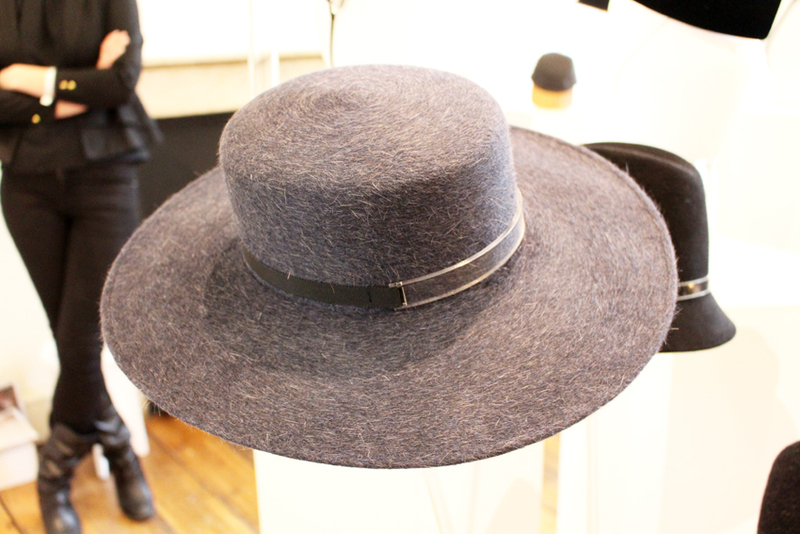 I loved Benoit Foucher‘s hat designs. 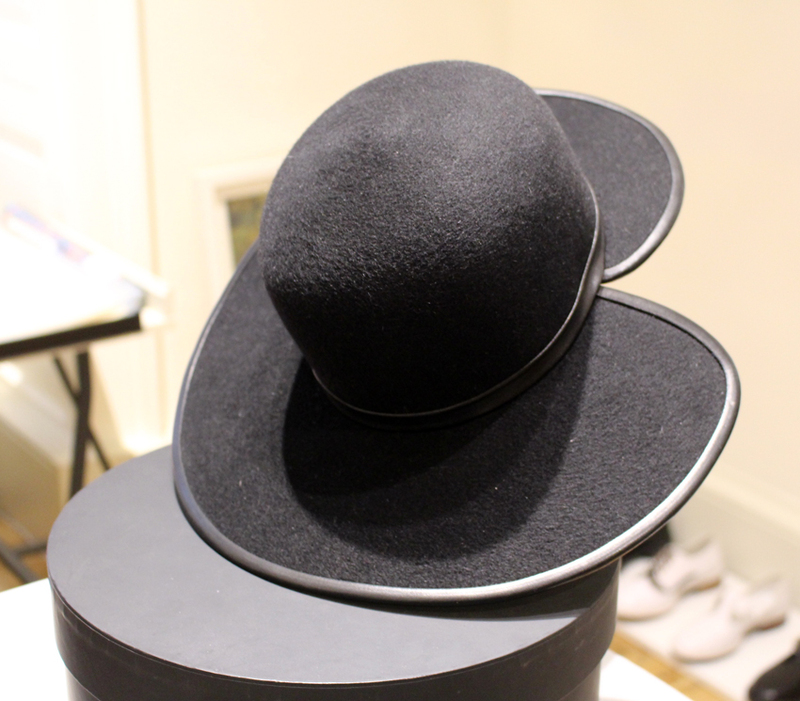 This French designer’s AW15 collection incorporates duality of shapes, unusual lines combined with the unique feel to it – made in France, each hat has a serial number and is shaped on a wooden hat mould. Le Kilt offers a fresh, contemporary take on the timeless wardrobe classic – the kilt. Set up by Samatha McCoach in 2014, the brand is a homage to her family’s knit making heritage with some added dash of chic, playfulness and modernity. 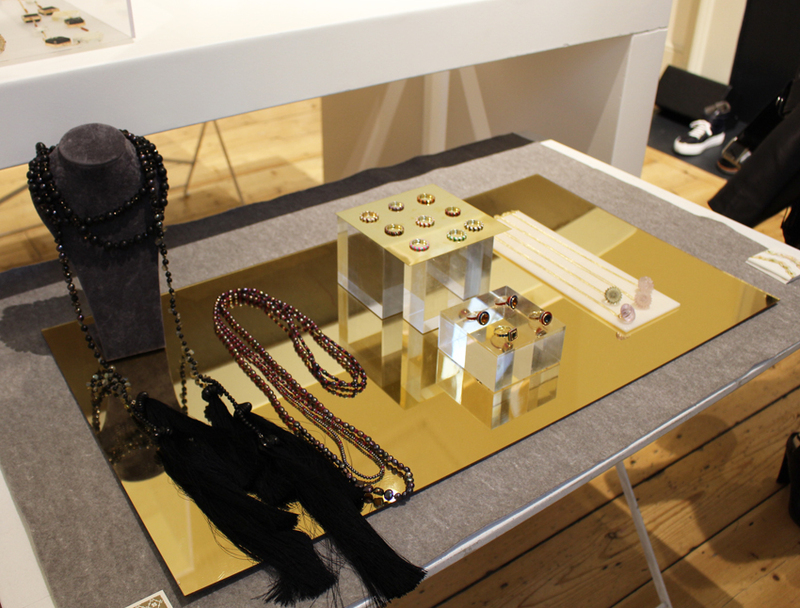 I really liked the jewellery collection presented by Alice Cicolini. 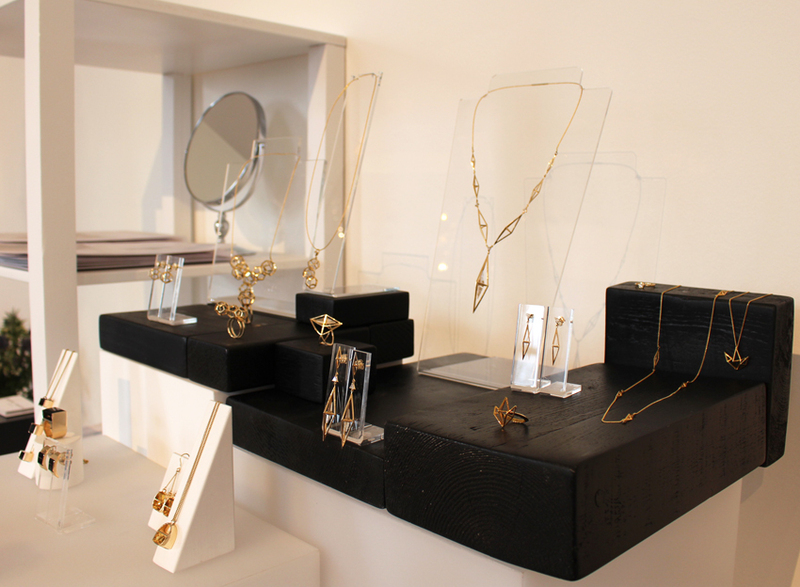 This is only a small selection of Touba London‘s designers – I wish I could feature them all! 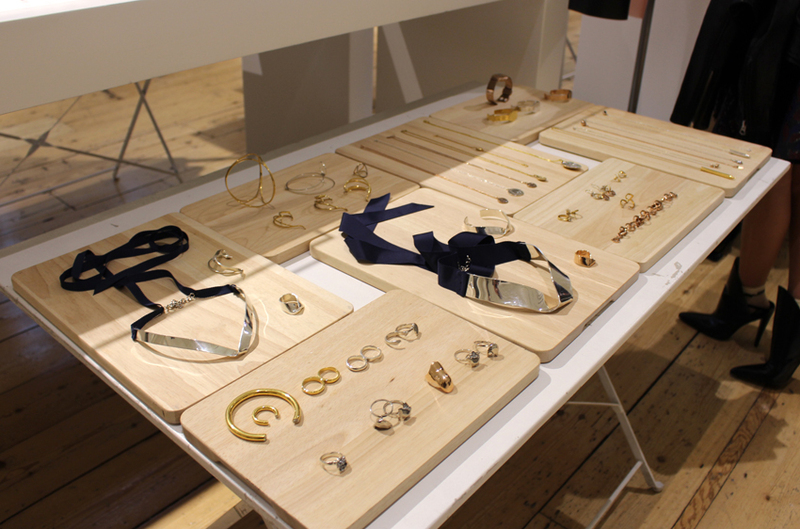 Brace yourself for some more fabulous jewellery designs next week! I am casting my mind back to my 2nd day at London Fashion Week… It seems like a long time ago now with both Milan and Paris Fashion Weeks well over, to me, however, it still resonates with a certain degree of euphoria and inspiration weeks on. 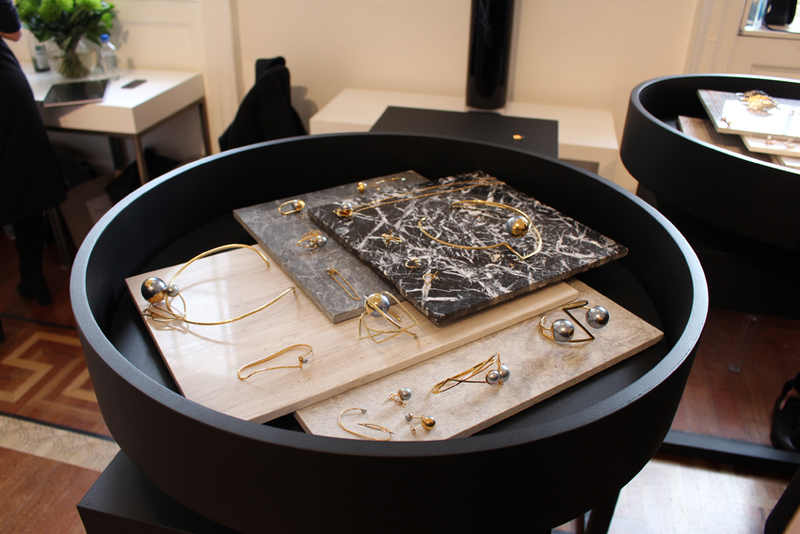 I will be sharing with you all the exciting brands I had met at Somerset House Designer Showrooms in the forthcoming posts. Today, though, it is a quick peek into my outfit on London Fashion Week Day 2 that Yahoo Lifestyle voted one of 14 best street styles on the day at Somerset House! How cool is that! 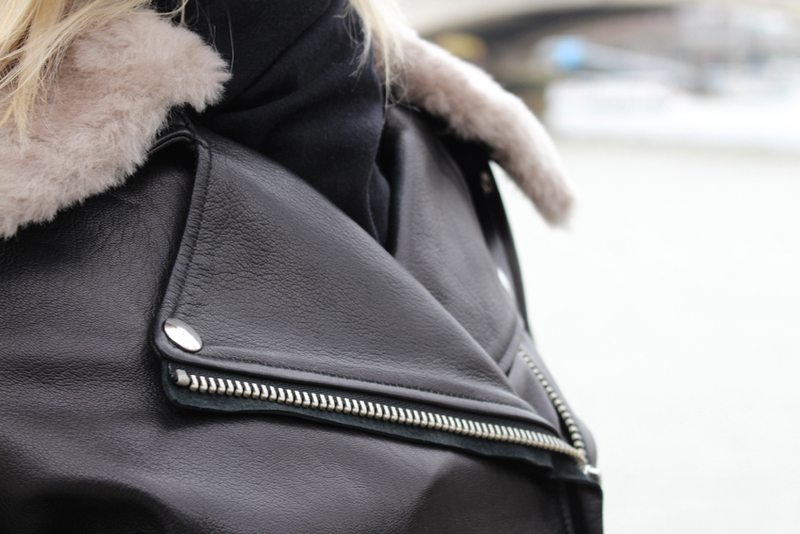 As you all know, I love shearling coats so when the weather still had London in its wintry grasp, I could not resist but to go for this gorgeous Rick Owens Shearling-collared leather jacket I picked up on theOutnet last year. I love the neutral, blush coloured leather and show-stopping oversized shearling shawl collar that will get you noticed from the crowd. 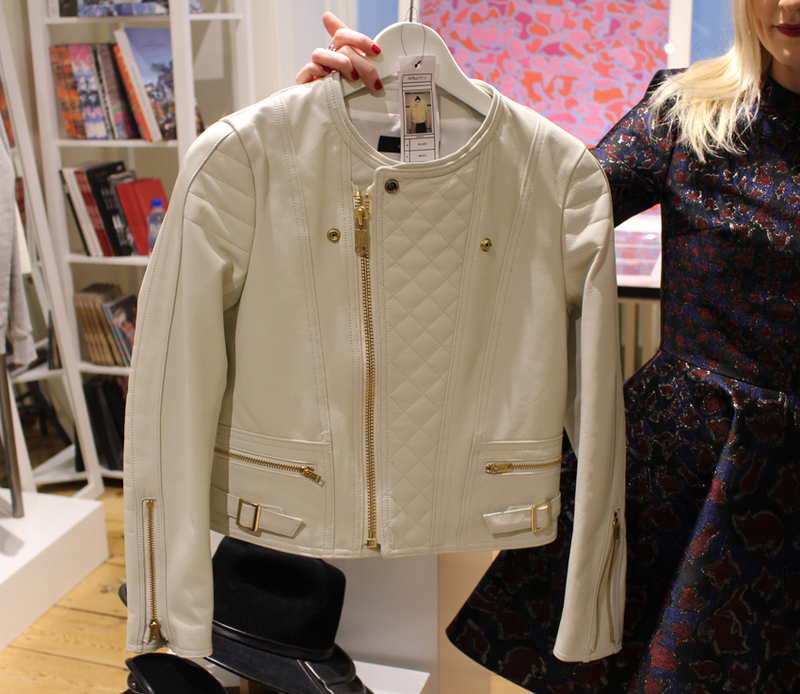 Rick Owens take a feminine approach to the classic biker jacket and offers up this flesh leather cropped version. I played with perfect proportions by layering the jacket over Proenza Schouler Flocked moiré-jacquard mini runaway dress I got from Net-a-Porter a couple of months ago. 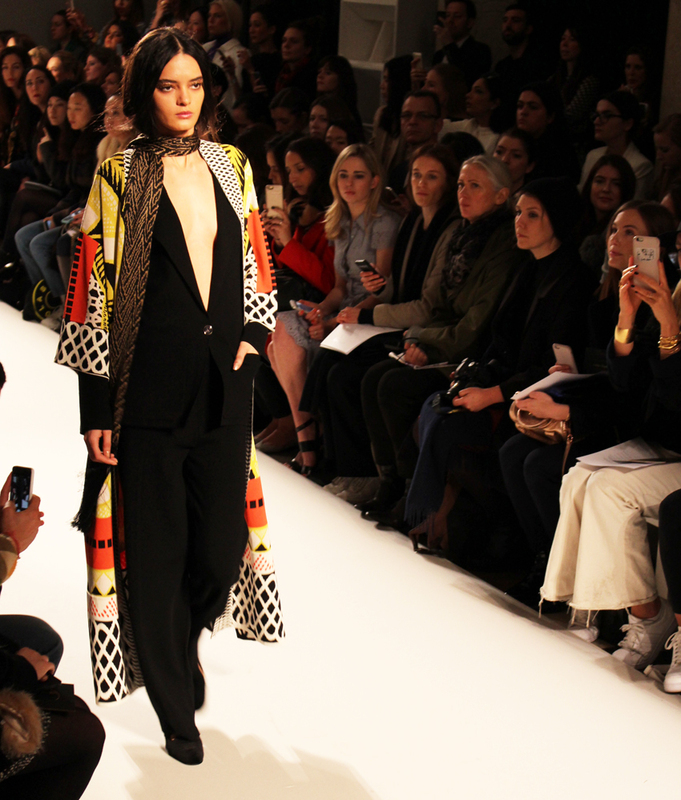 I can’t get enough of the bold multicolored Flocked moiré-jacquard and rich velvet flocking. Nipped in waist with rounded shoulders and wide short sleeves, the dress certainly gives off a modern look This navy and teal techno-fabric dress is, in my opinion, one of the best pieces from Proenza Schouler‘s “energy, humor, and speed.” Fall’14 collection. I worked it with pointed suede ankle boots and a leather clutch. Bottega Veneta Nero Suede Boots I got from MyTheresa never let me down. 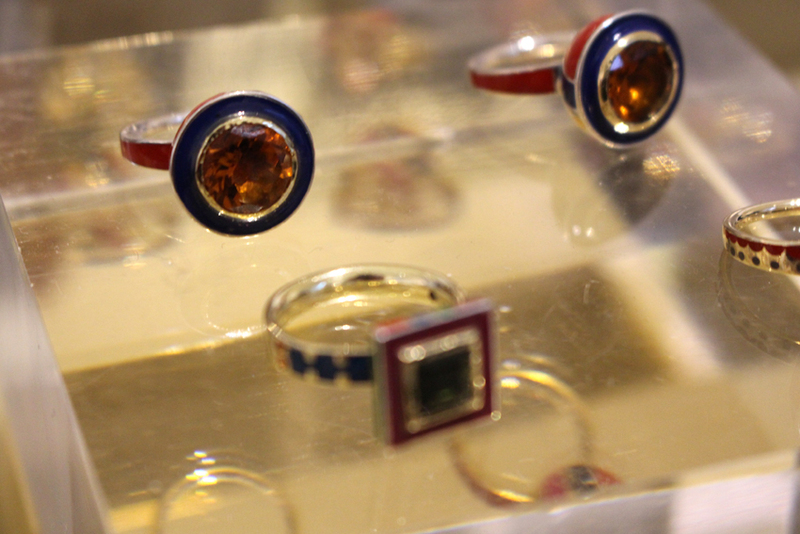 Every time I wear them, they do make a statement adding a dash of playful originality! I love the elegant silhouette contrasted against a whimsical flame-like cut out design to the ankle. I accessorised my look with JAEGER black ponskin gloves, Balenciaga Square-frame acetate sunglasses, also from theOutnet and Emilio Pucci two tone blue fold-over leather zipped clutch with gold-tone signature logo and a fold-over top that goes so perfectly with the hue of the dress. I picked it up on theCorner sale. 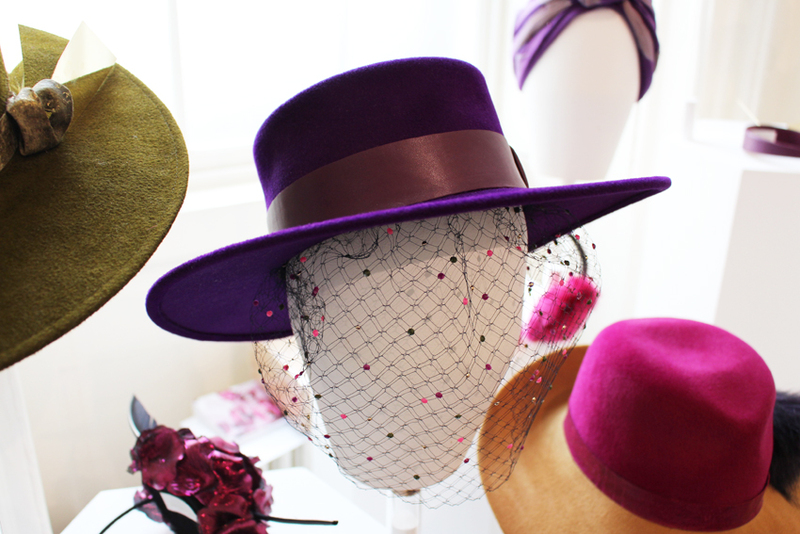 I am so fond of the vibrancy of the colours and luscious fuchsia silk inside lining! Like my style? Sign up for more of my weekly fashion updates! 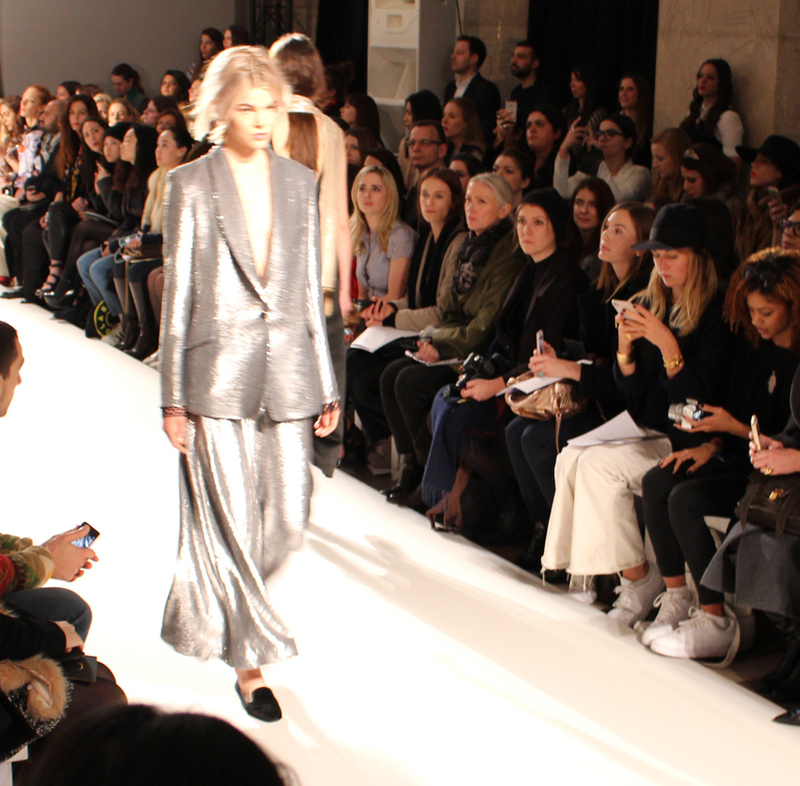 I am catching my breath half way though the London Fashion Week 2015. What a fantastic three days it has been! This is Britain’s most exclusive and fashion event organised by British Fashion Council brimming with a list of world-famous designer catwalks and showrooms keeps attracting style-savvy fashion lovers looking to get their Fall/Winter wardrobe fix from over 100 of the county’s brightest and best designers. I loved every minute at Somerset House amongst world class emerging talent and catwalk world-famous ready-to-wear designer shows spread across London. 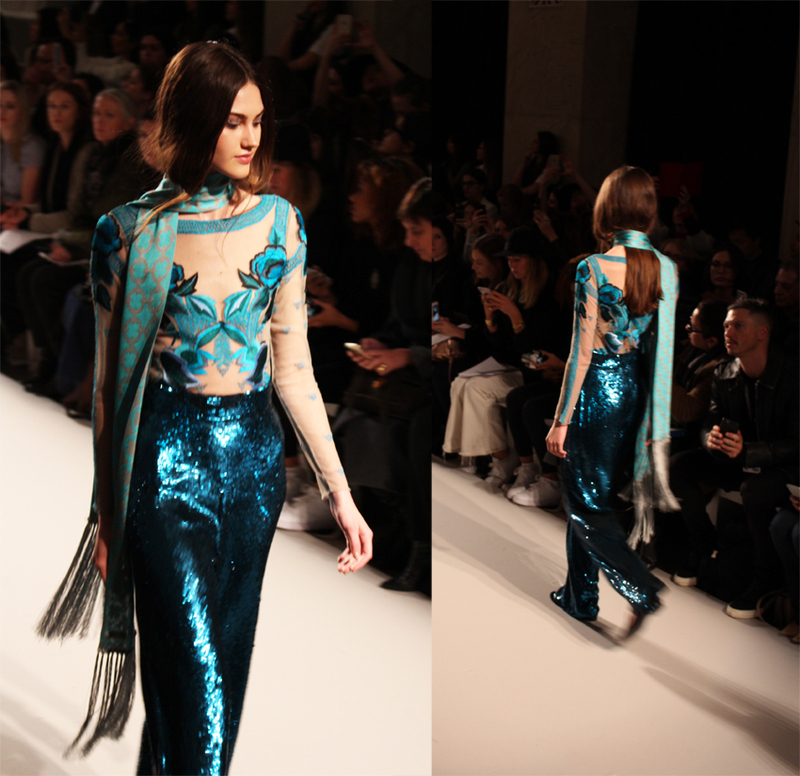 This afternoon, in collaboration with London London, I had the pleasure to attend Temperley London Winter 2015 Collection catwalk show that I wanted to share with you today. 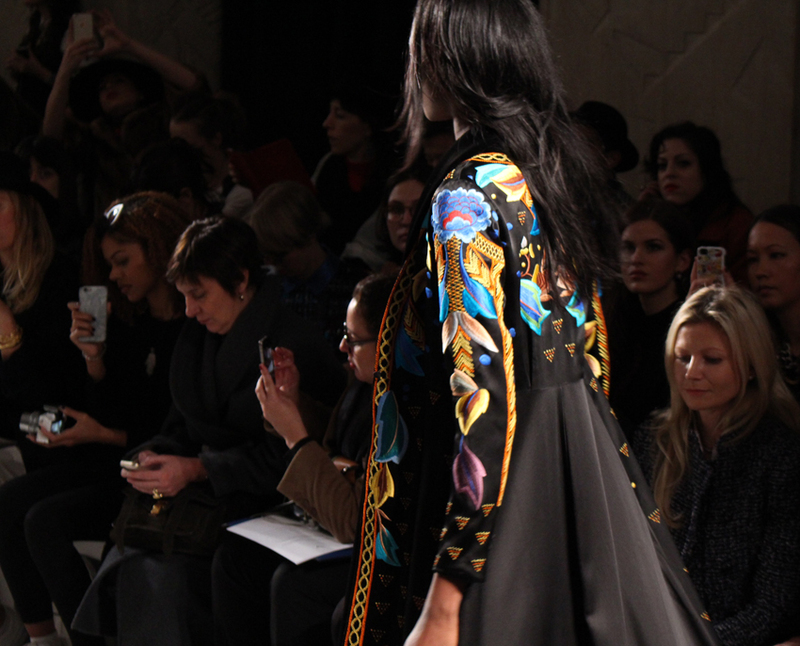 In 2015, Alice Temperley has entered her 15th year of business heading up this long standing independent British luxury brand. Her Winter 2015 Collection features luxurious and laid-back glamour of feminine romantic looks with monochrome and high-octane fabrics and stunning tribal inspired patterns of red, blue and gold prints. 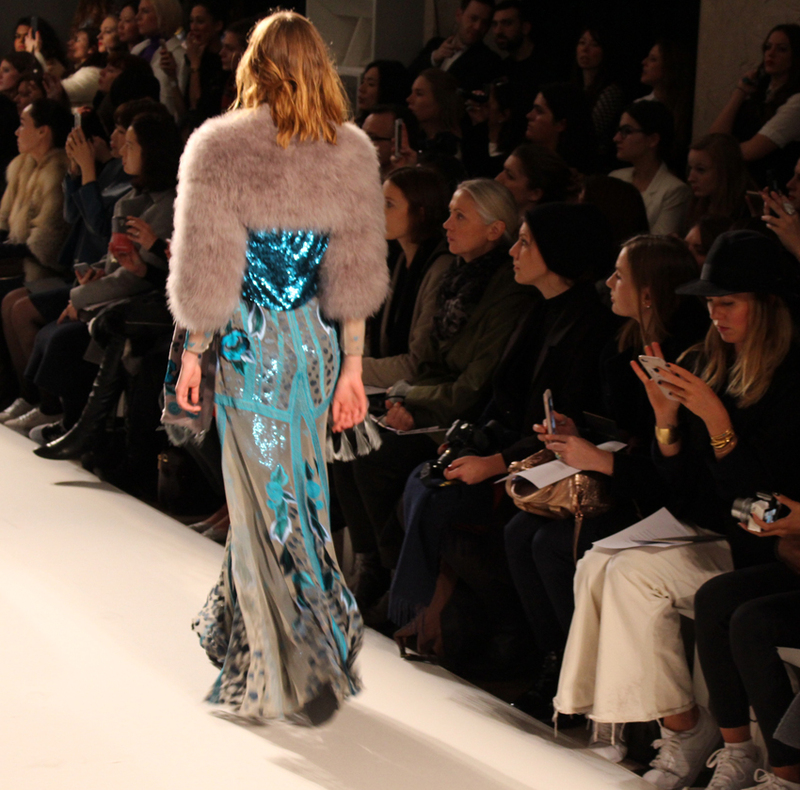 With Sophie Dahl at the catwalk’s forefront, Temperley does not disappoint in floor sweeping floaty dresses and jumpsuits that provide an easy and elegant alternative to gowns, bold floral embroidery on velvet and opulent sheer chiffon, not to mention, the show-stopping dense matte silver sequined culotte suit. The designer made London Fashion Week even more inclusive and accessible by putting on a runaway two pregnant models alongside models of different ages ultimately reiterating who her target audience is! 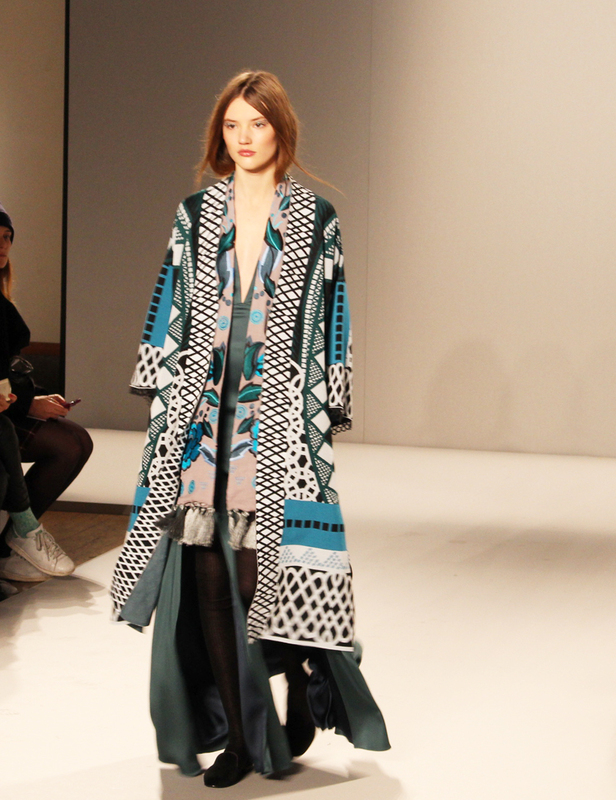 My absolute favourite was the folksy, almost nomadic bold geometric print full-length dress with a pastel fur shawl. I managed to take the picture of Jodie Kidd, amongst other A-listers attending the show! With a collection of 40 ready-to-wear fresh looks you are all but well equipped to decide what your Fall/Winter wardrobe is going to look like!